I recently moved into a condo, and there is plenty of room to do some growing out on the balcony. The balcony faces east, so it gets a lot of direct sunlight from sunrise until about 1-2 PM. 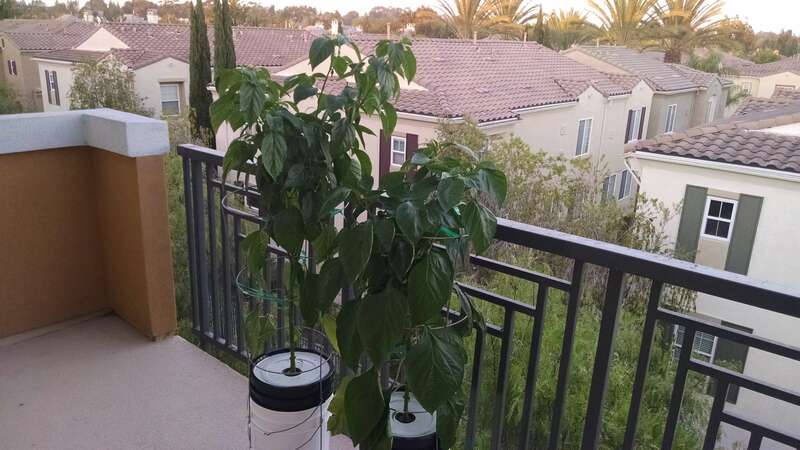 The balcony gets quite warm, so I will grow some plants that like the heat: peppers! I grew Golden Marconi peppers a few years ago, and the yield and taste were very good. 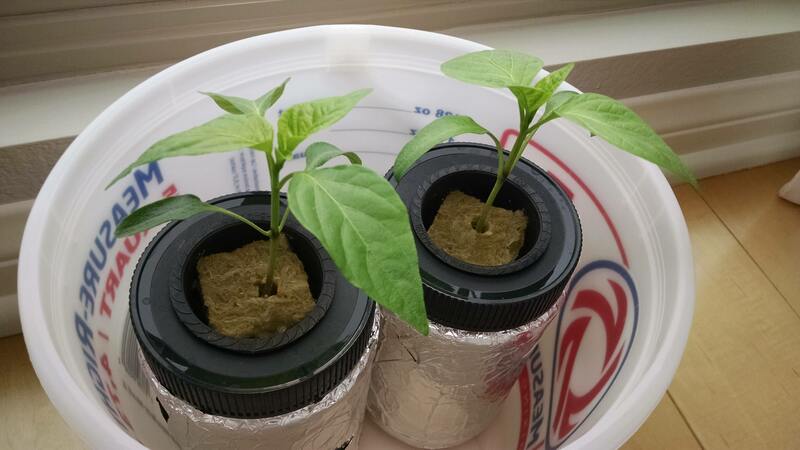 I will also grow the Snapper variety, which is another bell pepper variety. Neither of these peppers are considered ‘hot’. Jun 19 = Day 0. Plants started from seed: Golden Marconi (Baker Creek), Snapper (Park Seed). Seeds (3) sowed into one 1.5 inch rockwool cube in 2 inch net-pot. Moistened with Seedling Blend, a dilute blend of fertilizers. N-P-K (in ppm): 22-12-13. Covered with plastic wrap until seeds have germinated. Jun 29 = Day 10. Seeds are germinating. Placed in a sunny window for 4 hours per day, and then under a fluorescent light (spiral bulb, 23W, color = 6500k) for 8 hours per day. The bulb emits a lot of heat, so the bulb is positioned 7-8 inches above the plants. Jul 9 = Day 20. 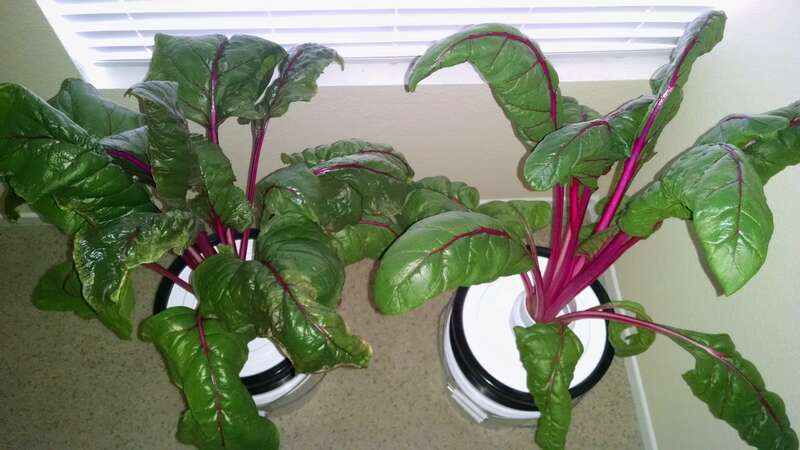 Plants transferred to small plastic jars containing 3 cups of Regular-Strength Blend. N-P-K (in ppm): 103-41-168. 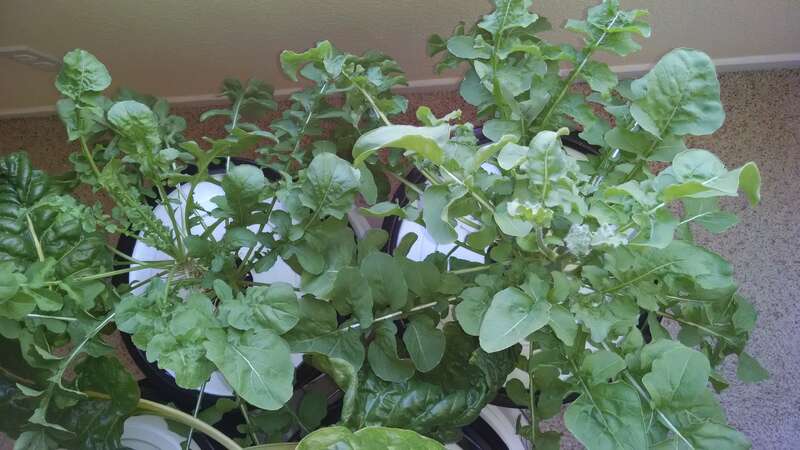 The plants receive about 4 hours of sunlight in the morning, and then they are supplemented with a fluorescent light bulb for an additional 8 hours in the afternoon. My set-up is not fancy, I just use a clip-on light from my local hardware store. Jul 19 = Day 30. 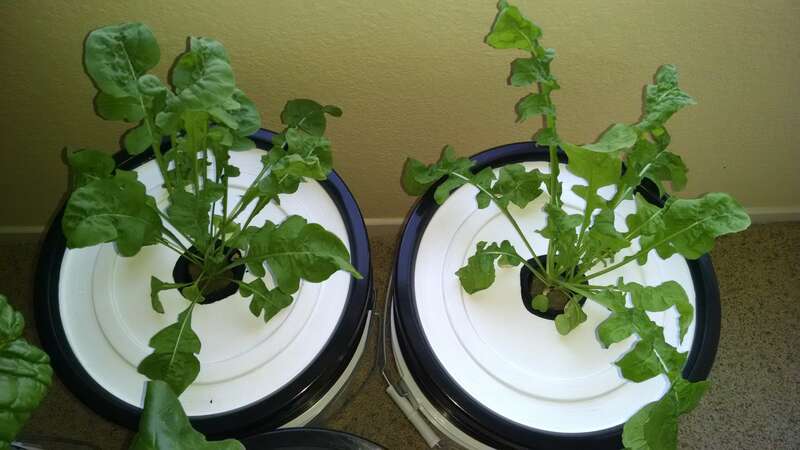 Installed plants into 5-gallon buckets containing Regular-Strength Blend. N-P-K (in ppm): 103-41-168. The plants are placed outside on my balcony. 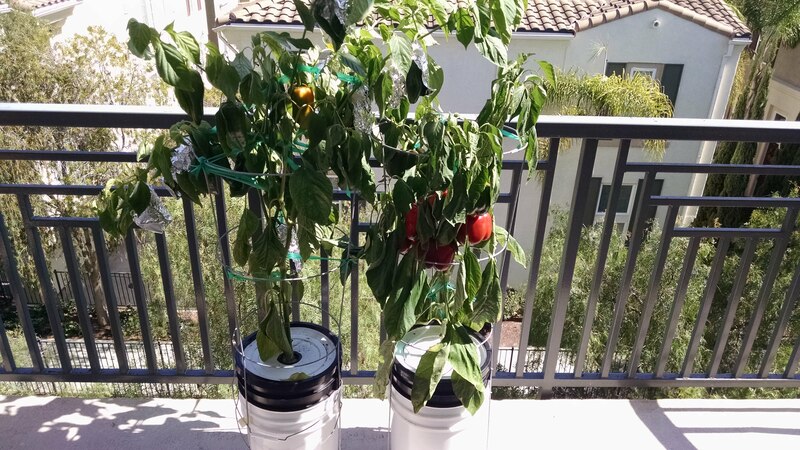 I have been putting them outside for a few hours each day to try to harden them up, but they still tend to wilt in full sun, so I will use a 70% shade cloth for the first few weeks. Jul 19 = Day 30. Golden Marconi (left) and Snapper (right). 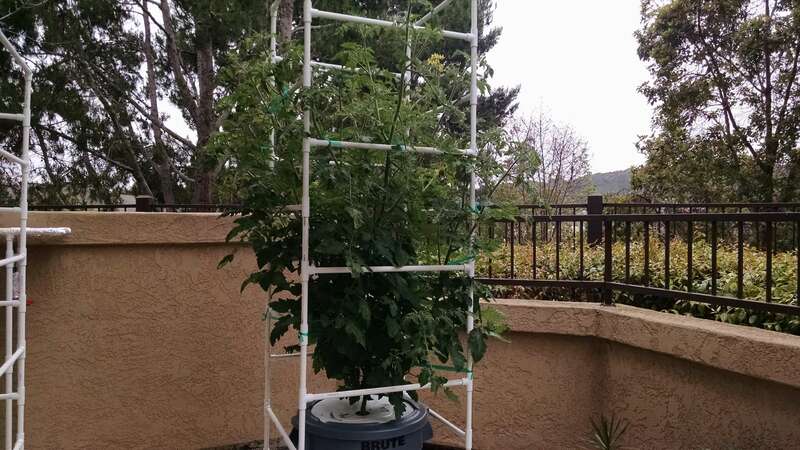 I slid tomato cages over the buckets, and then covered the plants using 70% shade cloth. 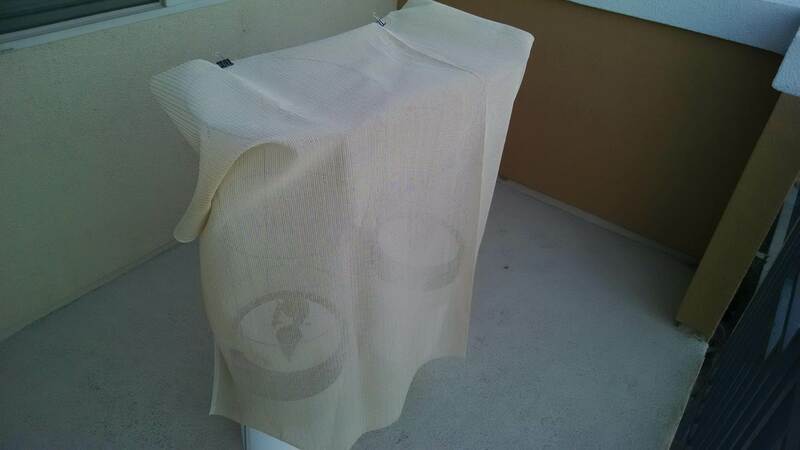 I covered the front and top with shade cloth, but left the back open to get good airflow. Aug 7 = Day 49. Golden Marconi (left) and Snapper (right). Aug 7 = Day 49. The plants are growing quickly now, and are starting to produce flowers. 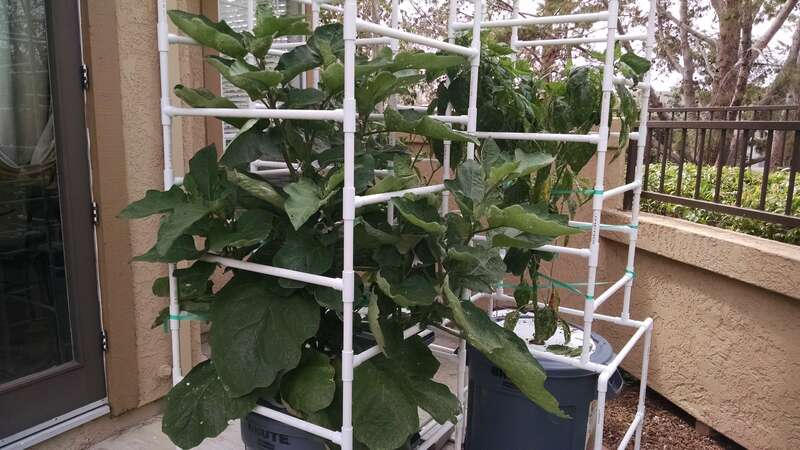 Since the plants are starting to get tall, garden tape was used to secure them to the metal cages. 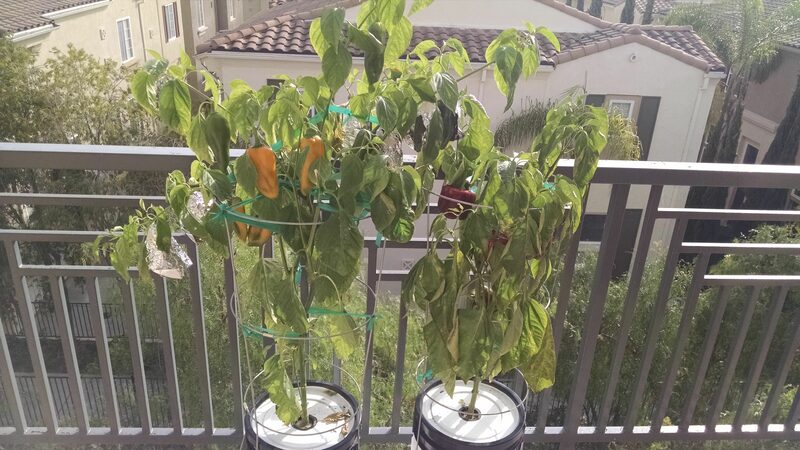 I took the shade cloth off the plants to expose them to full sun, but my outdoor growing location is just too hot (90-100 °F), and all leaves became wilted within 1 hour! So I reinstalled the shade cloth, and the plants are OK now. Aug 26 = Day 68. The plants are getting tall, so the shade cloth was completely removed. There are several flowers on each of the plants. 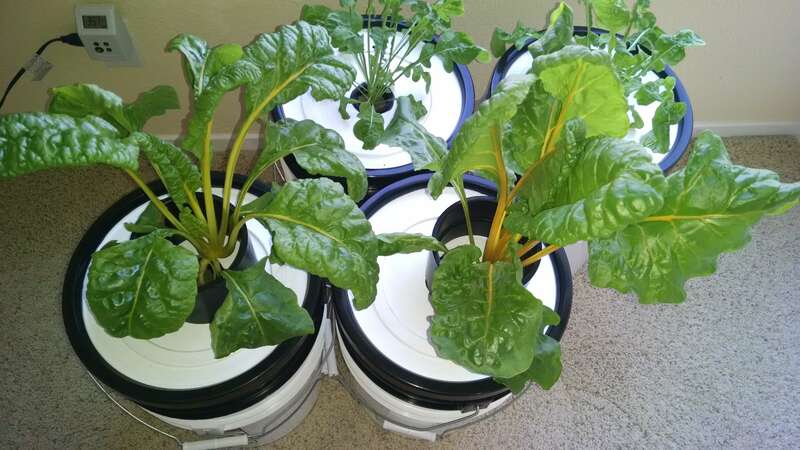 Upon lifting the buckets, I can tell that there is very little fluid remaining, so I added fresh fluid (Regular-Strength Blend) to each plant: Golden Marconi (1 gallon), Snapper (1.5 gallons). Aug 26 = Day 68. Golden Marconi (left), Snapper (right). 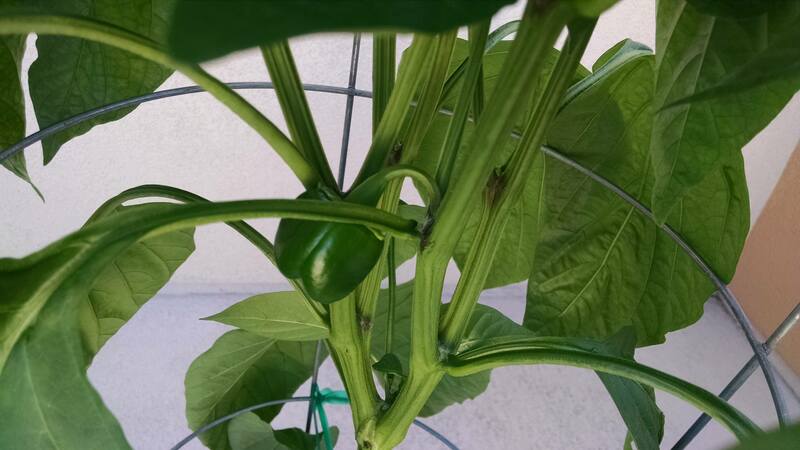 A pepper developing on the Snapper plant. Aug 30 = Day 72. Added Regular-Strength Blend (1.5 gallons) to each plant. Sep 3 = Day 76. Added Regular-Strength Blend (2 gallons) to each plant. Sep 12 = Day 85. Added Regular-Strength Blend (2 gallons) to each plant. 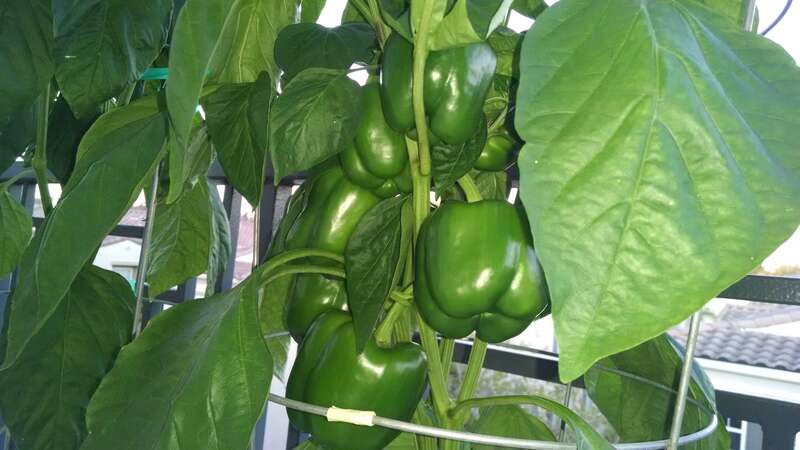 Lots of peppers are now developing on both plants. Sep 12 = Day 85. Golden Marconi (left), Snapper (right). Sep 20 = Day 93. Added Regular-Strength Blend (1.5 gallons) to each plant. Sep 30 = Day 103. Added Regular-Strength Blend to each plant: Golden Marconi (2.5 gallons), Snapper (1.5 gallons). A few of the Golden Marconi peppers were showing signs of sunscald (too much direct sun exposure), so some of the exposed peppers were loosely wrapped in foil to prevent further sun damage. Oct 7 = Day 110. Harvested 3 Golden Marconi peppers. Oct 15 = Day 118. Golden Marconi (left), Snapper (right). 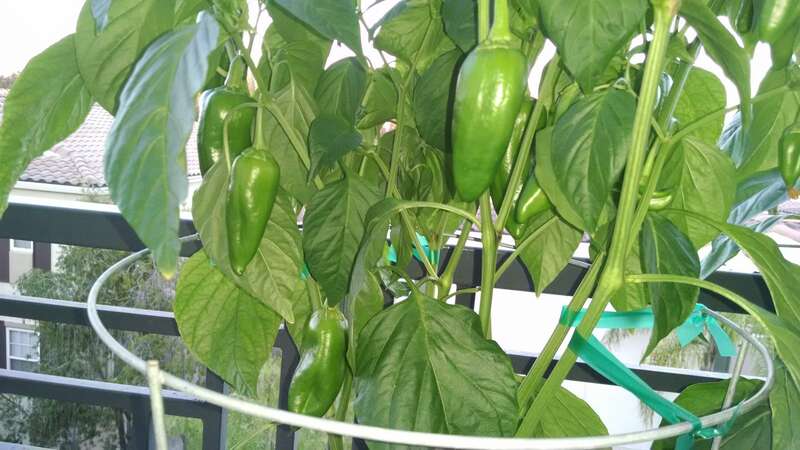 Lots of ripe peppers! Oct 15 = Day 118. Added Regular-Strength Blend (1.5 gallons) to each plant. Harvested 1 Golden Marconi and 5 Snappers. Oct 15 = Day 118. Today’s harvest. Oct 19 = Day 122. Harvested 2 Golden Marconi peppers. Oct 22 = Day 125. Golden Marconi (left), Snapper (right). Oct 22 = Day 125. Harvested 3 Golden Marconis and 4 Snappers. 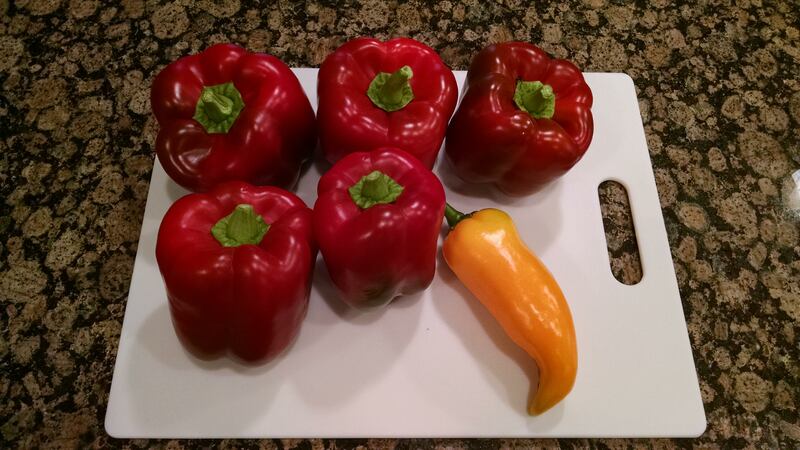 This was the last of the Snapper peppers, but the Golden Marconi still has several peppers ripening on the plant. Oct 22 = Day 125. Today’s harvest. Oct 28 = Day 131. Harvested 2 Golden Marconi peppers. Oct 29 = Day 132. 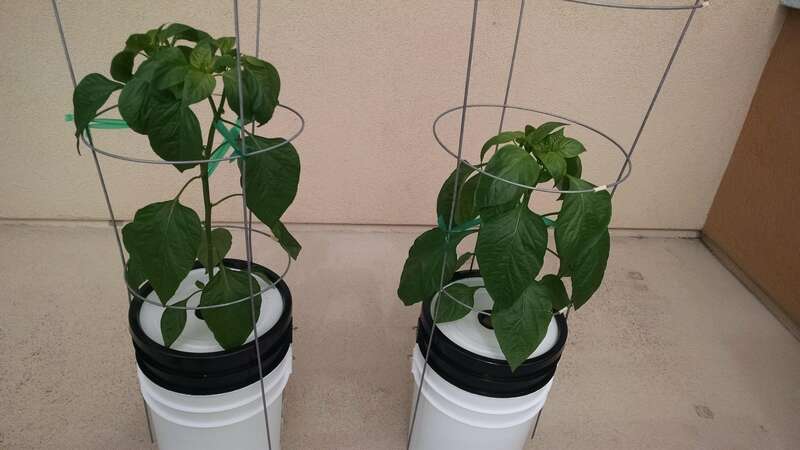 Added Regular-Strength Blend to each plant: Golden Marconi (1.5 gallons), Snapper (1 gallon). Nov 10 = Day 144. Harvested the final 6 Golden Marconi peppers of the season. Even though there is plenty of fluid remaining in the buckets, the plants are looking poor and are losing leaves. Plants were discarded at this time. Approximately 1 gallon of fluid remained in each bucket. 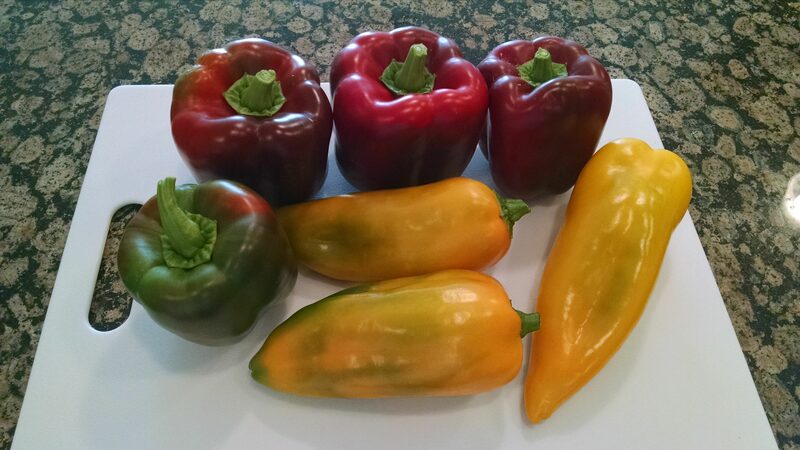 Total harvest for each plant: Golden Marconi = 17 peppers, Snapper = 9 peppers. Total fluid used by each plant: Golden Marconi = 17.5 gallons, Snapper = 16.5 gallons. 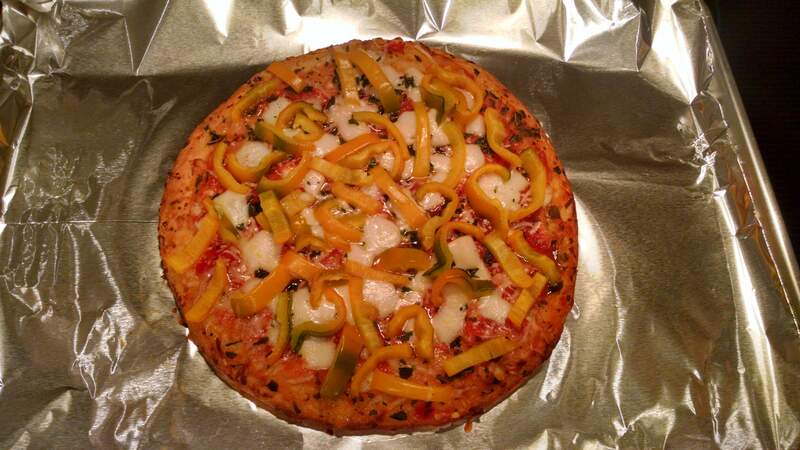 A Golden Marconi pepper sliced and cooked on a pizza. Boil water in a pot on High heat, then add the quinoa and turn down to Low heat. Cover and simmer for 10-13 minutes, until quinoa is cooked and has absorbed all the water. Quickly cool the quinoa by either spreading it out on a large plate and placing in the fridge, or by surrounding the whole pot of cooked quinoa in a larger vessel of ice water. Set this aside. To toast the pine nuts, add the nuts to a small frying pan or skillet. Cook on a stove over Medium heat. As the pan gets warm, keep stirring the pine nuts until they are toasted (takes about 5 minutes). Do not let them burn! Then, put the pine nuts on a plate to cool. In a large bowl, combine the peppers, cucumber, tomatoes, and cilantro (just the leaves, no stems). Squeeze the juice of the lime over the mixture. In a separate cup, combine the olive oil and vinegar. Stir vigorously with a fork until it forms an emulsion. Then stir in the salt and black pepper. Pour this dressing over the cut vegetables and mix. 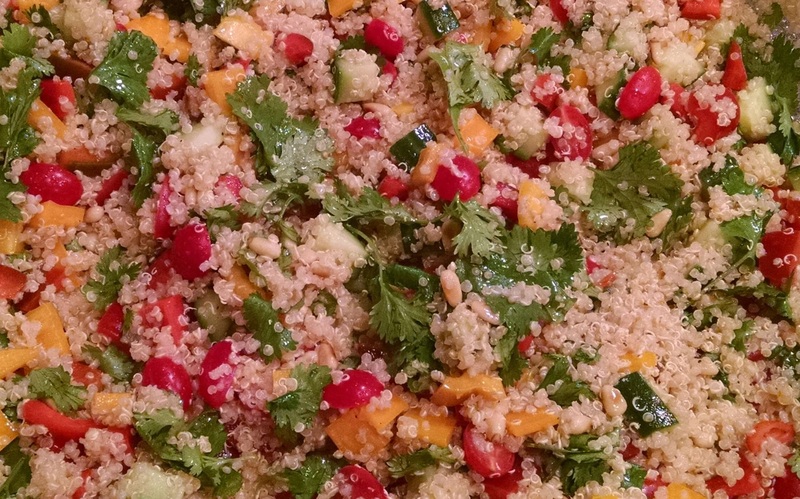 Add the cooled quinoa and the toasted pine nuts, mix, and enjoy! Makes about 8 servings. 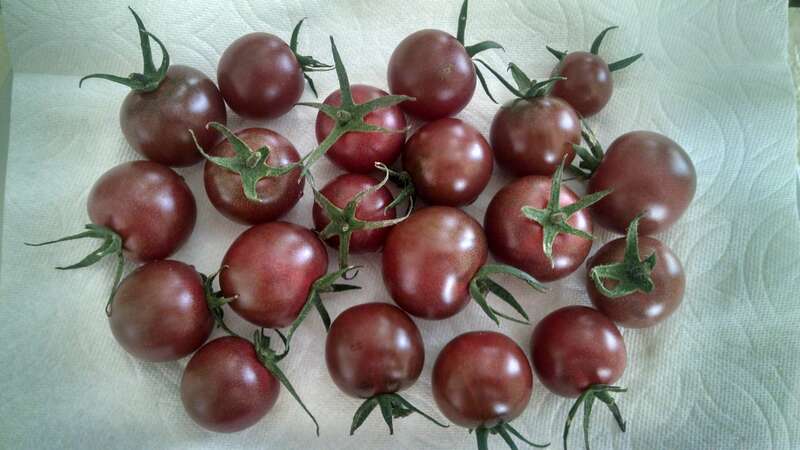 Black Cherry is an indeterminate tomato variety, with fruits that are about the size of ping pong balls. I last grew this variety 3 summers ago, and the tomatoes were delicious. 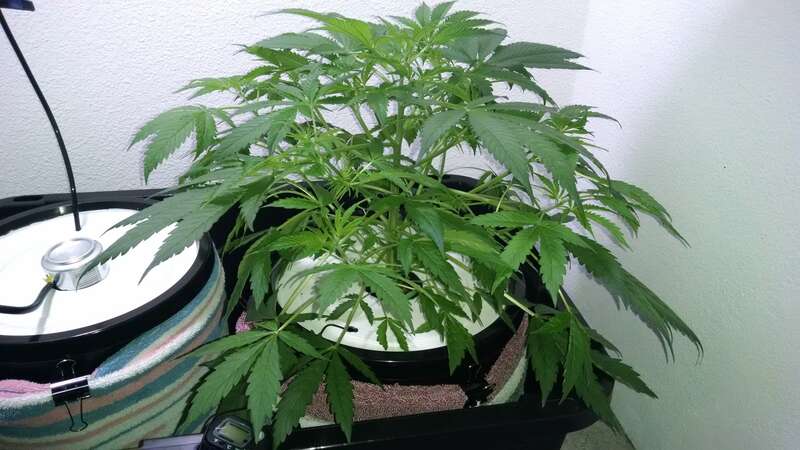 I will be growing this plant outside in a 32 gallon bucket, and I will definitely need to watch the fluid level and add more as needed. I expect this plant will get huge (6-8 feet tall) and will consume more than 60 gallons of fluid over the course of the season. Day 0. Plant started from seed (Baker Creek). Seeds (3) sowed into one 1.5 inch rockwool cube in 2 inch net-pot. Moistened with Seedling Blend, a dilute blend of fertilizers. N-P-K (in ppm): 22-12-13. Day 4. The seeds have germinated, and are placed directly under a fluorescent light (spiral bulb, 23W, 6500k) for 18 hours per day. The bulb is positioned 3-4 inches above the plants. Day 11. Plant is now being put into a sunny window for 3 hours per day, then back under the fluorescent light for an additional 15 hours. Day 14. 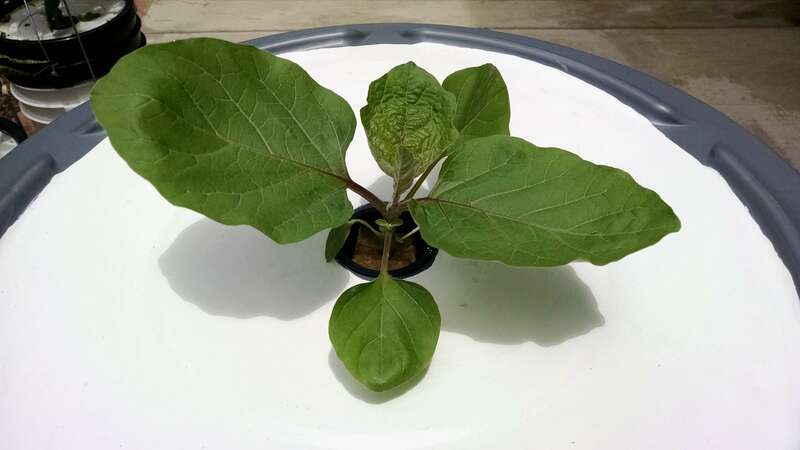 Plant transferred to a small plastic jar containing 3 cups of Regular-Strength Blend. N-P-K (in ppm): 103-41-168. Day 24. 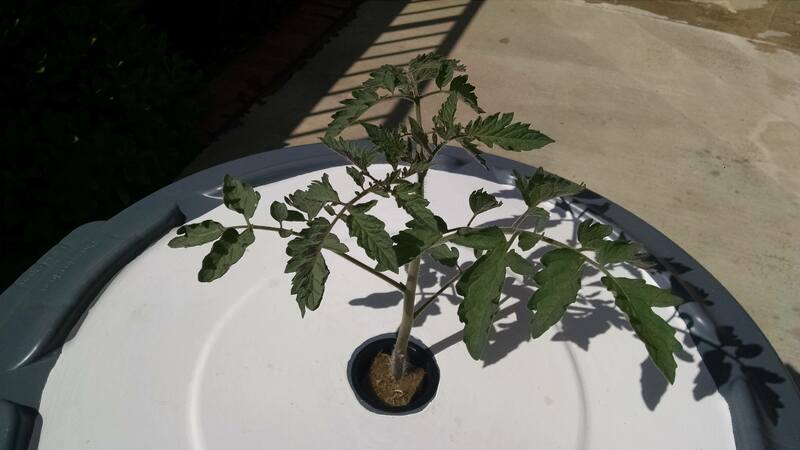 Installed the plant outside in a 32 gallon bucket. 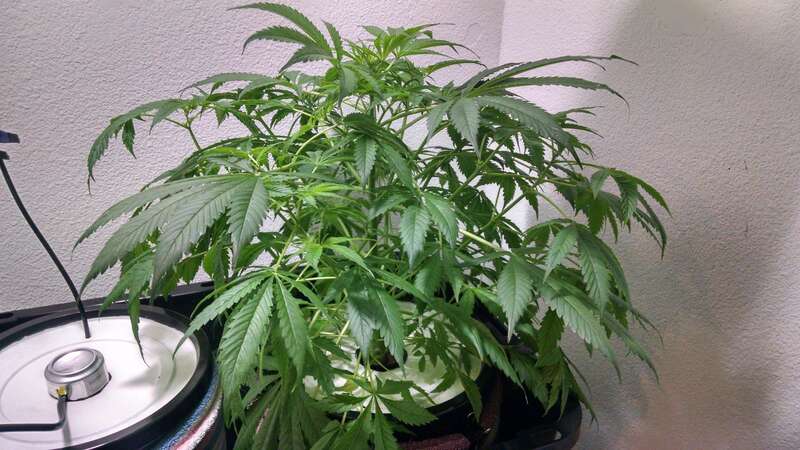 The plant is currently getting about 4-5 hours of direct sunlight per day. The fertilizer solution is the MasterBlend-based Regular-Strength Blend. N-P-K (in ppm): 103-41-168. Day 58. Plant is over 3 feet tall. Day 59. Healthy root system. Fluid level has dropped about 6 inches so far. Day 80. Bucket seems to be about 1/3 full, so I added 8 gallons of fresh Regular-Strength Blend. Day 80. 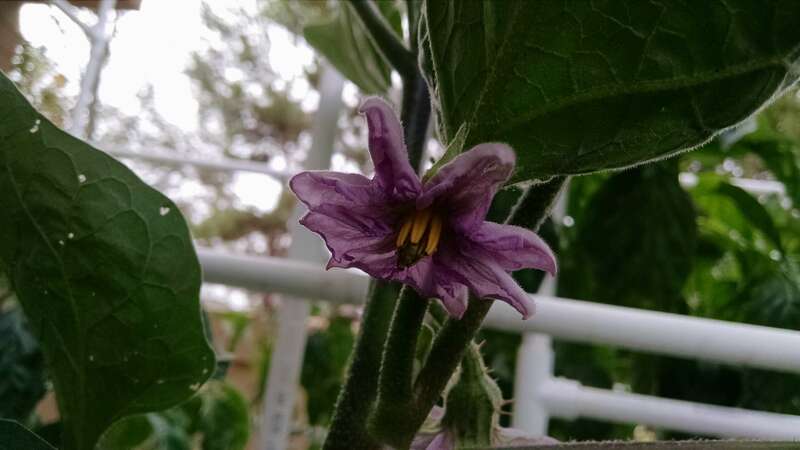 Plant is 5 feet tall, with lots of flowers and several tomatoes developing. Day 89. Added 8 gallons of nutrient solution: Regular-Strength Blend. Day 95. Added 9 gallons of nutrient solution: Regular-Strength Blend. Day 101. Added 12 gallons of nutrient solution: Regular-Strength Blend. Day 112. Added 8 gallons of nutrient solution: Regular-Strength Blend. Began harvesting ripe tomatoes at this time. Total = 20 tomatoes. Day 112. Harvested 20 tomatoes. Day 116. Plant has exceeded the height of the support structure. I have begun trimming to prevent further upward growth. Day 119. Harvested 48 tomatoes. Total = 68. Day 123. Harvested 65 tomatoes. Total = 133. Added 9 gallons of nutrient solution: Regular-Strength Blend. Plant is losing a lot of its lower foliage due to powdery mildew. Day 126. Harvested 104 tomatoes. Total = 237. Day 126. Tomatoes are being harvested faster than I can eat them. Time to make a big batch of salsa! Day 128. Harvested 112 tomatoes. Total = 349. Day 131. Harvested 80 tomatoes. Total = 429. Day 134. Harvested 152 tomatoes. Total = 581. Day 134. 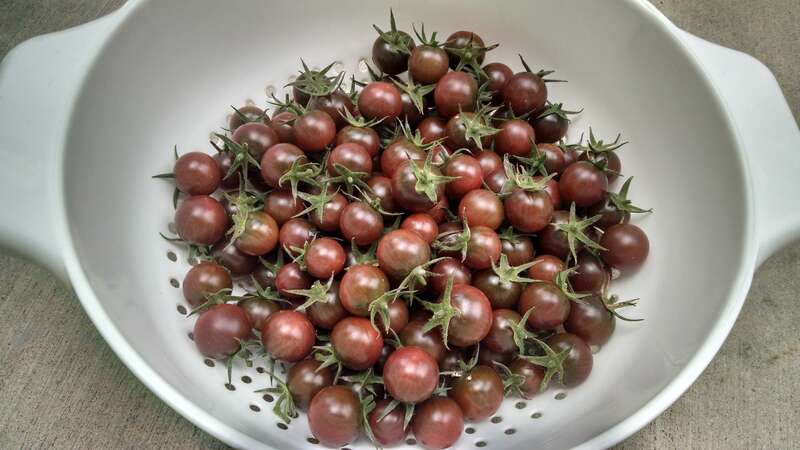 A big harvest today, 152 tomatoes! Day 134. 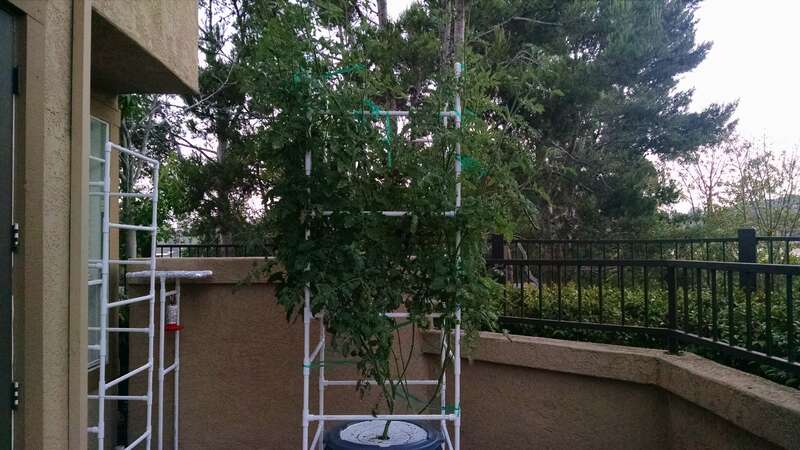 The foliage looks terrible, but the plant continues to provide lots of ripe tomatoes. Day 137. Harvested 102 tomatoes. Total = 683. Day 140. Harvested 29 tomatoes. GRAND TOTAL = 712. 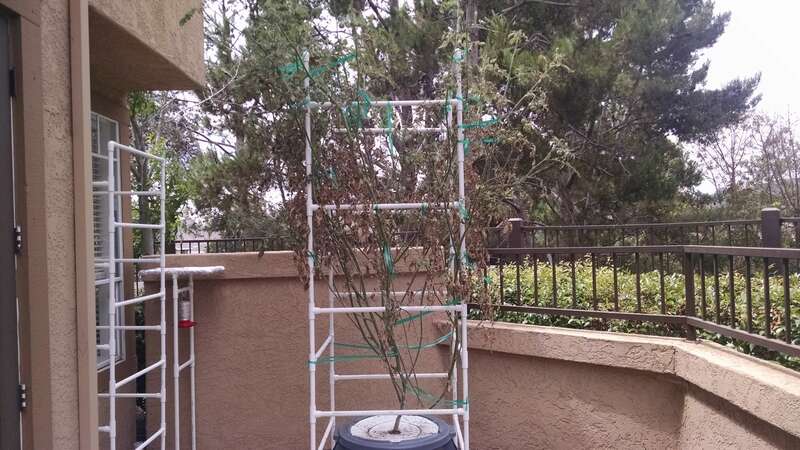 At this point, many tomatoes are cracking on the vine, and the plant foliage is mostly dead. Plant was taken down at this point. This plant started with 32 gallons of fluid, and I added 54 gallons during the season. There was still 11.5 gallons left when I took the plant down. Total fluid used = 74.5 gallons. 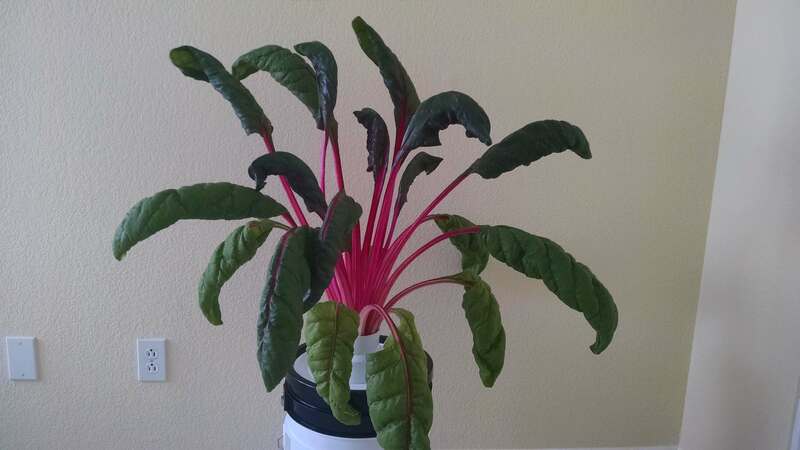 Swiss chard is one of my favorite greens. I steam the stalks and leaves and then coat them with a dressing of olive oil, garlic and black pepper. 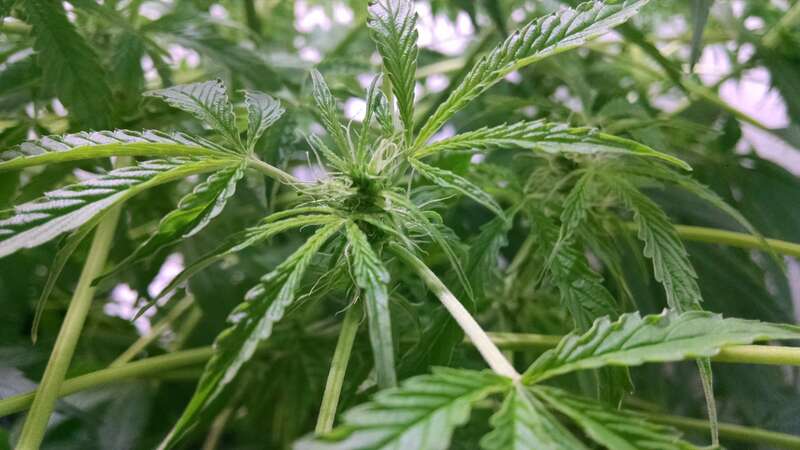 By only harvesting the outer leaves and allowing the inner leaves to keep growing, these plants can provide numerous harvests. 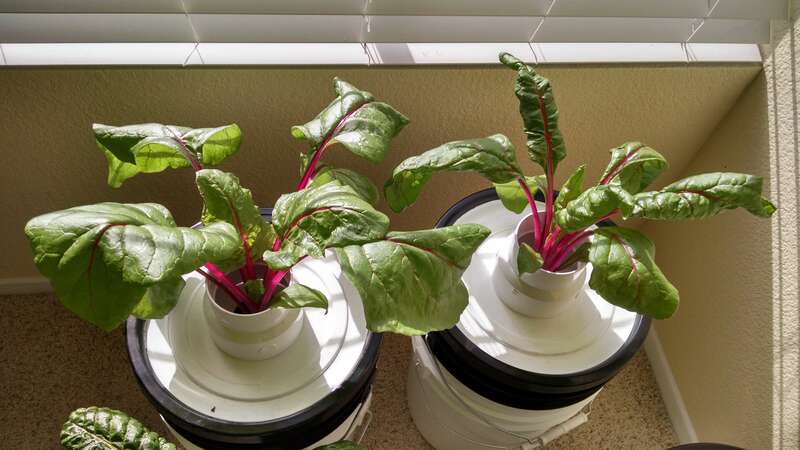 I have been growing El Dorado yellow Swiss chard for several months, but the plants are starting to get old, so now I am starting these Flamingo Pink plants. Hopefully I can get some decent harvests from these plants before my indoor grow room gets too hot in the summer. Day 0. Plants started from seed (Baker Creek). 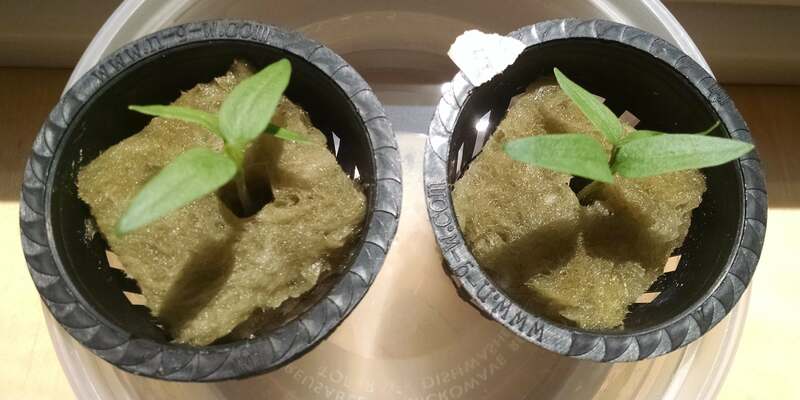 Seeds sowed in 1.5-inch rockwool cubes in 2-inch net-pot. Used 2 rockwool cubes, with 2-3 seeds per cube. Moistened with Seedling Blend, a dilute blend of fertilizers. N-P-K (in ppm): 22-12-13. Day 4. 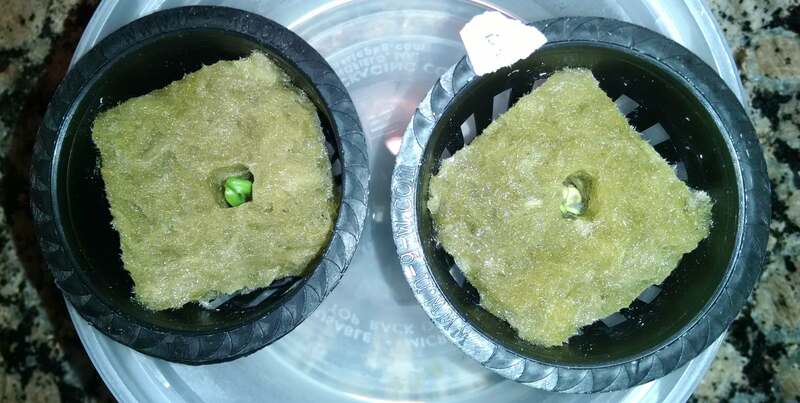 The seeds have germinated, and were placed directly under a fluorescent light (spiral bulb, 23W, 6500k) for 18 hours per day. The bulb is positioned 3-4 inches above the plants. Day 11. Plants are now being put into a sunny window for 3 hours per day, then back under the fluorescent light for an additional 15 hours. Day 14. 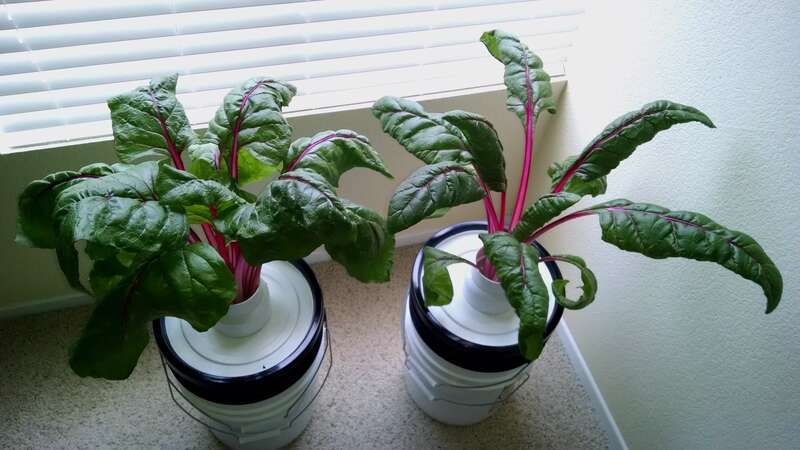 Plants transferred to small plastic jars containing 3 cups of Regular-Strength Blend. N-P-K (in ppm): 103-41-168. Day 21. 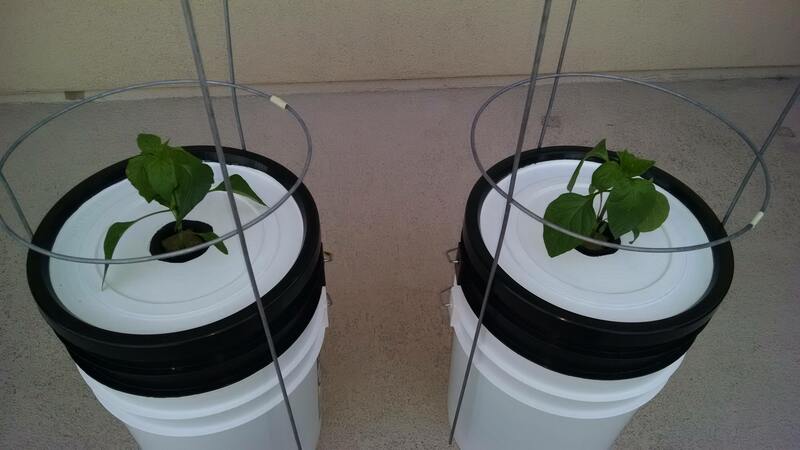 Installed the plants into two 5 gallon buckets using the MasterBlend-based Regular-Strength Blend. N-P-K (in ppm): 103-41-168. Plants will continue to grow indoors, placed in front of a sunny window where they will receive 4 hours of direct sunlight per day. Day 28. 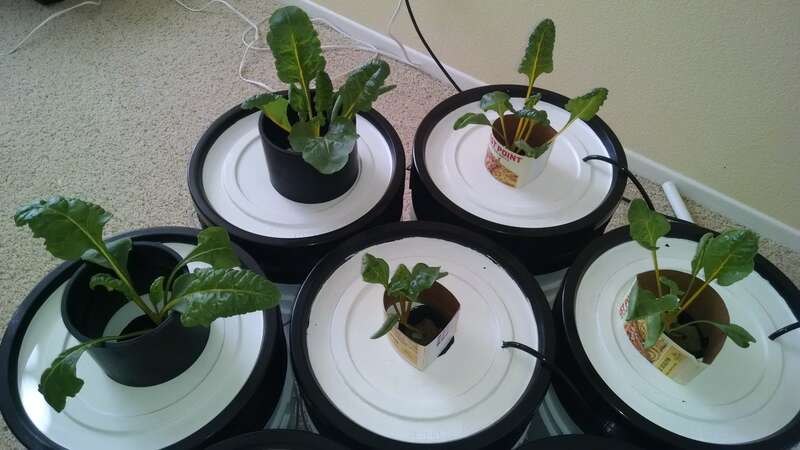 Installed white PVC couplings around the base of the plants to help them stand upright. Day 69. Began to harvest lower leaves. Added more Regular-Strength Blend to each bucket. Left bucket: 1.5 gallons. Right bucket: 0.5 gallons. Day 69. El Dorado is in the front, Flamingo Pink is in the back. Day 81. The leaves of the plant on the left are turning brownish. Day 81. Plant on the left has a bit of white fuzzy fungus on its roots. Day 81. The leaves of the plant on the left are turning brown, possibly due to a fungal infection on the roots. Before the leaf quality can deteriorate any further, the entire plant was harvested at this time. Day 94. Added 0.75 gallons Regular-Strength Blend to the remaining bucket. Day 111. Added 2 gallons Regular-Strength Blend. Day 117. 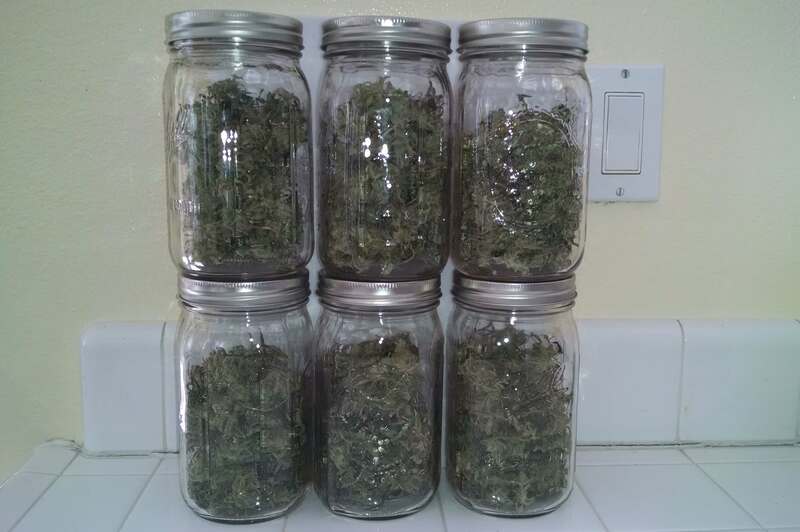 Harvested entire plant. Total fluid used by this plant = 6.5 gallons. 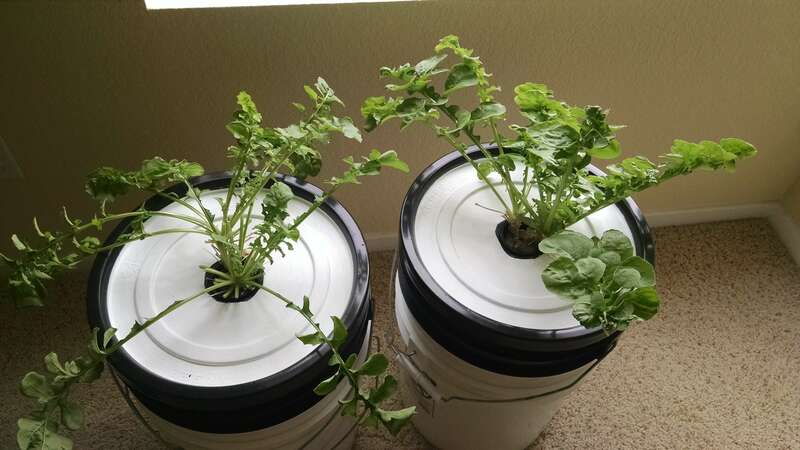 Connect two 5 gallon buckets together using PVC tubing and fittings as described here: Two Bucket System. Use a water pump (PonicsPump PP09205, 92 gallons/hour) to circulate the fluid between the two buckets. Use an air pump (Whisper Model 10, 0.5 L/min) and an air stone to elevate the oxygen levels in the fluid. The main source of lighting will be a 200-Watt LED grow light. Use frozen jugs of ice to lower the temperature of the fluid to the desired level (64-68 °F, 18-20 °C). Frozen jugs will need to be replaced every 24 hours. Wrap the buckets in towels to provide some temperature insulation, and put the whole assembly inside of a 27-gallon storage tote, to contain the fluid in case of leaks. The Two-Bucket System, showing a water pump (purple) for fluid circulation and an air pump (yellow) for aeration. Fluid changes and other system maintenance is performed in the reservoir bucket (left), while the plant can grow undisturbed in the other bucket (right). Nov 27 = Day 0. Plant started from seed (Blimburn Seeds, sourced from SeedSupreme). Seed sowed in 1.5-inch rockwool cube in 2-inch net-pot. Moistened with Seedling Blend, a dilute blend of fertilizers. N-P-K (in ppm): 22-12-13. Nov 29 = Day 2. The seed has germinated. I can see the taproot emerging from the seed, but the leaves have not yet emerged. Nonetheless, I have placed the plant directly under a fluorescent light (spiral bulb, 23W, 6500k) for 18 hours per day. The bulb is positioned 3-4 inches above the plant. The bulb generates a lot of heat, so I placed a small fan about 3-4 feet away from the plant to blow air on it during the day. I also placed the plant on top of a heating pad (set on ‘low’), which cycles on/off every 30 minutes during the night to keep the plant warm. Dec 7 = Day 10. Plant is about 1-inch tall, and the main root is about 4-inches long with many branches. 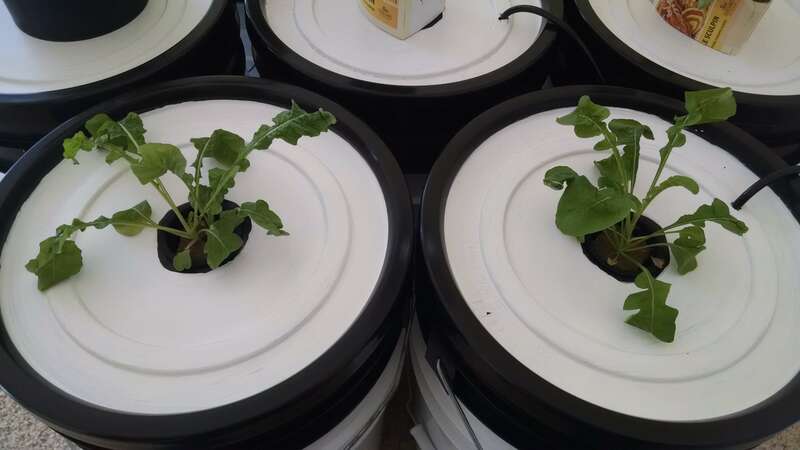 To ensure that the root system has enough room, the plant was moved into a slightly larger 3-cup container containing the same nutrient solution as above. Dec 10 = Day 13. 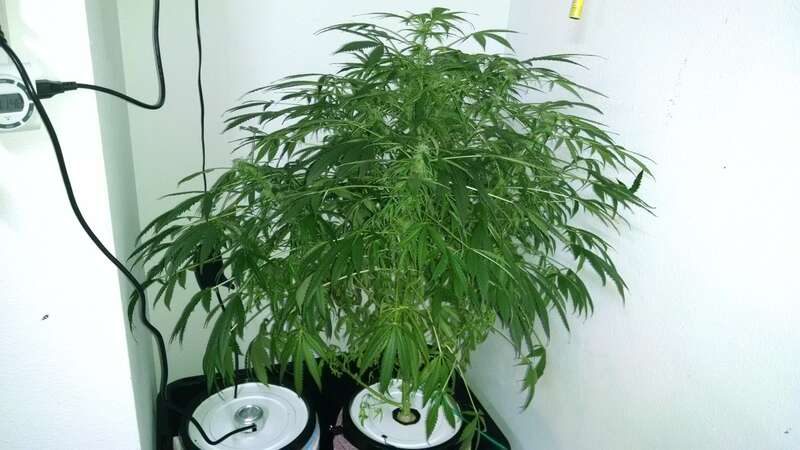 To acclimate the plant to a higher concentration of nutrients, the solution was changed to the following half-strength solution (per gallon of tap water): 1 g MasterBlend 4-18-38, 1 g calcium nitrate, 0.5 g magnesium sulfate, 0.1 mL Dyna-Gro Pro-TeKt, 1.3 mL pH Down. pH = 6.0. N-P-K (in ppm): 52-21-84. Dec 13 = Day 16. The first set of real leaves is turning yellowish, but the rest of the plant is green. Dec 13 = Day 16. 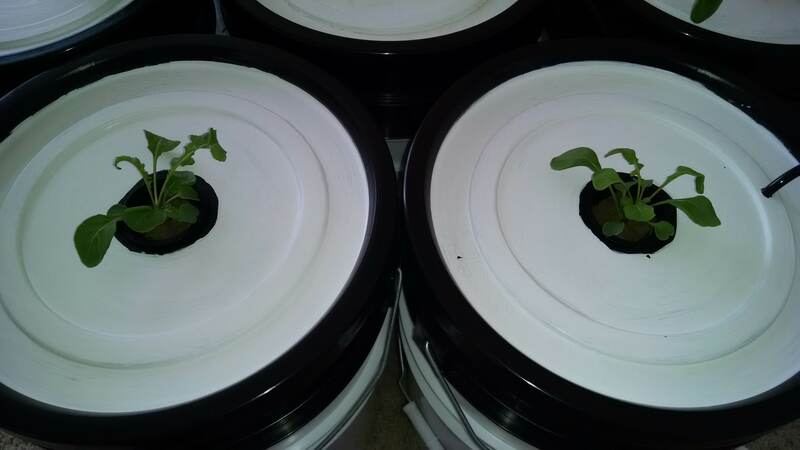 Plant transferred to the Two Bucket System. The system contains a total of 9 gallons of fluid, which results in having the fluid level just at the bottom of the net-pot in the plant bucket. For nutrients, the Regular-Strength Blend was prepared. N-P-K (in ppm): 103-41-168. For lighting, a 200-Watt LED grow light was positioned 18-inches above the plant, running 18 hours per day. A fan also blows on the plant during the hours that the light is on. If the pH is below 5.0 or above 6.5, the pH is brought back into the range of 5.5-6.0 by the addition of either pH Up or pH Down. Dec 19 = Day 22. Plant is 2 inches tall. Dec 28 = Day 31. Plant is 4 inches tall, 12 inches across. Jan 7 = Day 41. Plant is 8 inches tall, 20 inches across. Jan 19 = Day 53. Plant is 12 inches tall. Jan 27 = Day 61. The fluid in the buckets was entirely replaced. All remaining fluid (6 gallons) was removed from the system. 7 gallons of new fluid (Regular-Strength Blend) was added. Feb 3 = Day 68. Plant is 16 inches tall. Feb 15 = Day 80. The fluid in the buckets was entirely replaced. All remaining fluid (5 gallons) was removed from the system. 6 gallons of new fluid (Extra-Strength Blend) was added. This new fluid has a slightly higher nutrient concentration than the old fluid. N-P-K (in ppm): 124-50-202. Feb 19 = Day 84. Plant is 22 inches tall. Feb 25 = Day 90. Added 1 gallon of new fluid (Extra-Strength Blend). Mar 6 = Day 99. Plant is 28 inches tall. Mar 6 = Day 99. Plant is starting to flower. This plant is female, as evidenced by the white strings (pistils). Mar 6 = Day 99. The fluid in the buckets was entirely replaced. All remaining fluid (4 gallons) was removed from the system. 6 gallons of new fluid (Bloom Blend) was added. N-P-K (in ppm): 74-50-202. The Bloom Blend has a lower N content than previous blends, to discourage vegetative growth and encourage flowering. Mar 20 = Day 113. The fluid in the buckets was entirely replaced. All remaining fluid (3.5 gallons) was removed from the system. 6 gallons of new fluid (Bloom Blend) was added. Mar 31 = Day 124. The fluid in the buckets was entirely replaced. All remaining fluid (4 gallons) was removed from the system. 6 gallons of new fluid (Bloom Blend) was added. Mar 31 = Day 124. Plant is 36 inches tall. Apr 10 = Day 134. The fluid in the buckets was entirely replaced. All remaining fluid (4 gallons) was removed from the system. 6 gallons of new fluid (Bloom Blend) was added. Apr 14 = Day 138. Lots of buds still developing. Apr 24 = Day 148. The fluid in the buckets was entirely replaced. All remaining fluid (3 gallons) was removed from the system. 5 gallons of new fluid (Bloom Blend) was added. Apr 26 = Day 150. Plant is stabilized by addition of support straps. May 5 = Day 159. 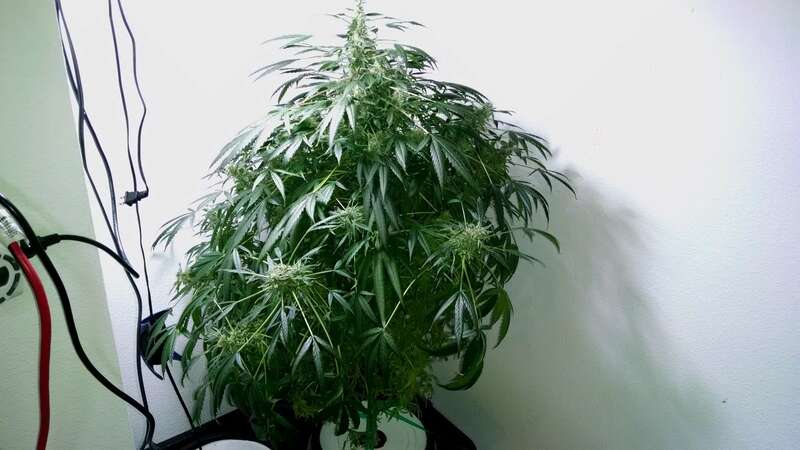 The plant has reached its maximum height (3 feet 5 inches) and is not growing any taller. Also, the leaf tips all over the plant are starting to burn, which indicates that the nutrient concentration is too high. The fluid in the buckets was entirely replaced. All remaining fluid (2.75 gallons) was removed from the system. 5 gallons of new fluid (2/3-strength Bloom Blend) was added. N-P-K (in ppm): 49-33-135. May 5 = Day 159. Leaf tips are burning, which indicates that nutrient concentration is too high. May 5 = Day 159. Plant has reached maximum height of 3 feet 5 inches. May 15 = Day 169. The fluid in the buckets was entirely replaced. All remaining fluid (2.75 gallons) was removed from the system. 5 gallons of new fluid (2/3-strength Bloom Blend) was added. N-P-K (in ppm): 49-33-135. May 23 = Day 177. The buds are covered with trichomes, which is where the cannabinoids are found. 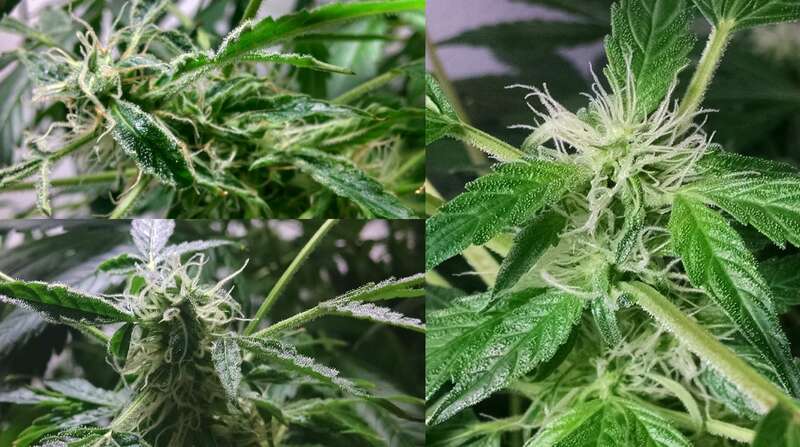 Most of the pistils have turned brown. The plant will likely be harvested soon. May 25 = Day 179. The fluid in the buckets was entirely replaced. All remaining fluid (2.5 gallons) was removed from the system. 5 gallons of new fluid (5/6-strength Bloom Blend) was added. N-P-K (in ppm): 62-42-168. Jun 5 = Day 190. 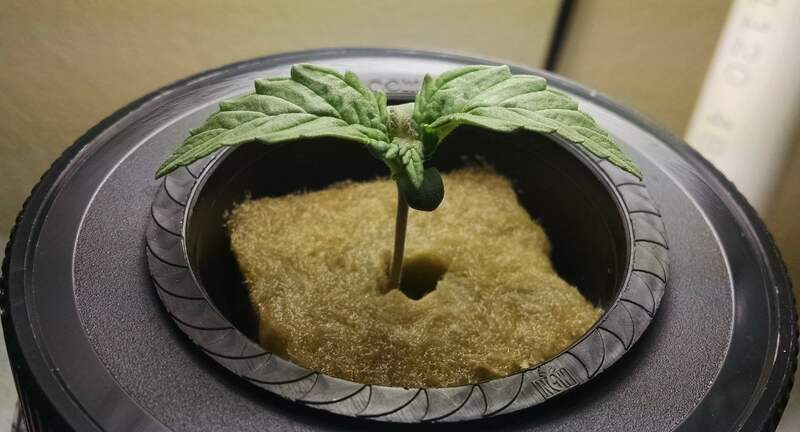 The terminal bud (cola). Jun 5 = Day 190. 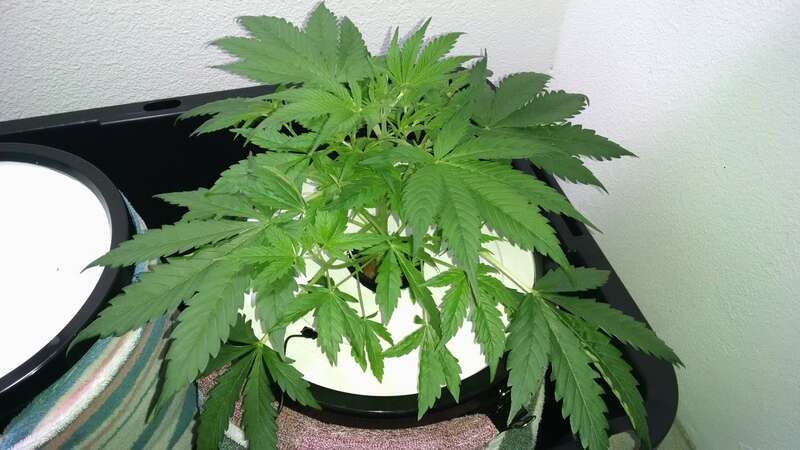 Many of the fan leaves are yellowing, especially near the terminal bud. 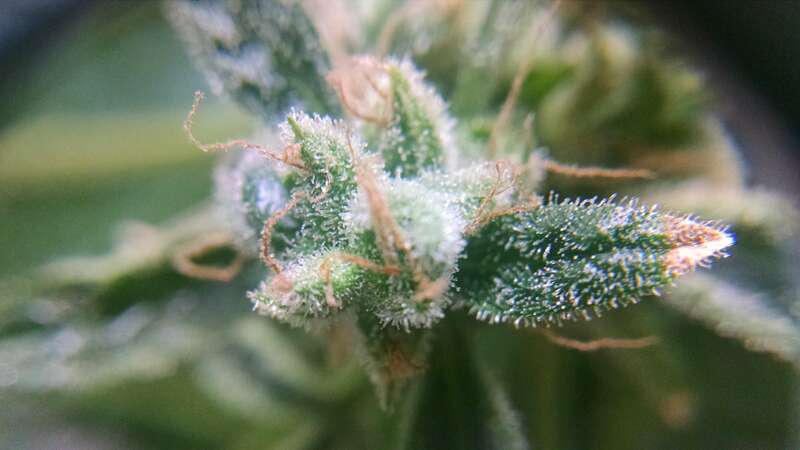 Upon inspection of the trichomes with a 30x magnifying glass, there are a few trichomes that are turning amber, but most appear to be clear or cloudy. 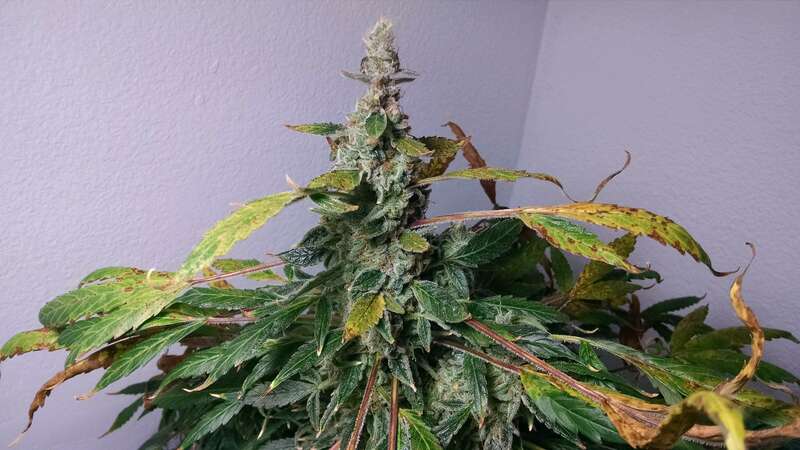 Almost all of the pistils on the plant have turned brown. I think the time has come to harvest this plant, since I do not want the cannabinoid quality to deteriorate. It has now been 13 weeks since this plant started to flower. 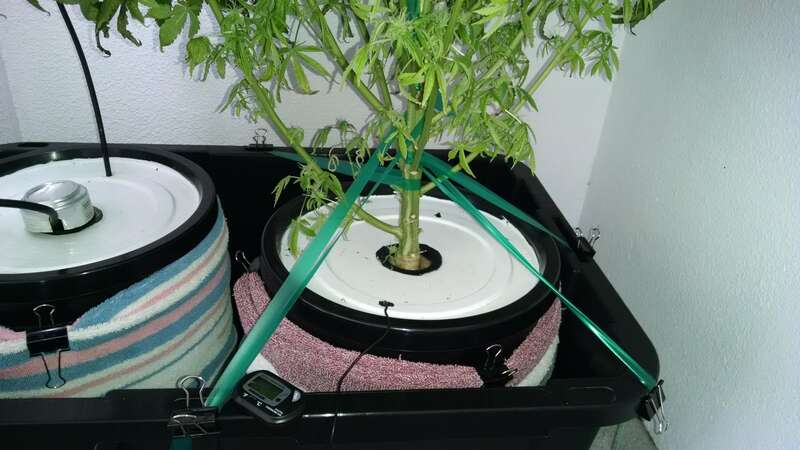 For the final step of the growing process, I will be performing a “flush”, which involves removing all nutrient fluid from the system and replacing with plain water (adjusted to pH 6). 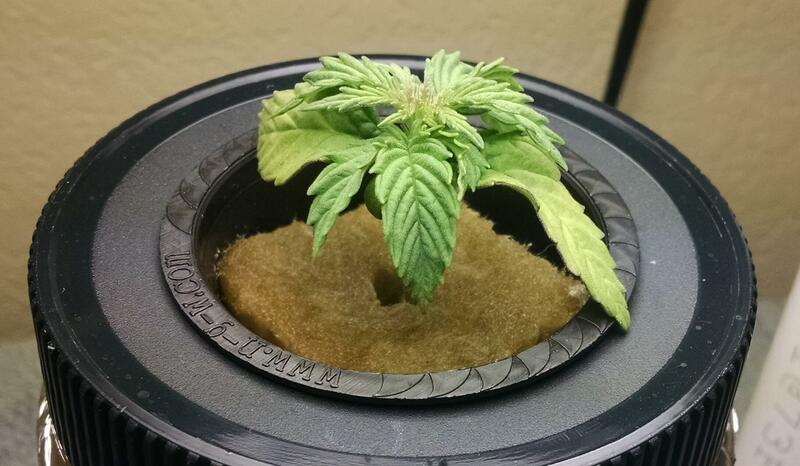 This can help to clear out any accumulated nutrients, resulting in a cleaner burning, better tasting final product. For the DWC system I am running, the flush only needs to occur for 1-2 days. All remaining nutrient fluid (3 gallons) was removed from the system. 5 gallons of plain water (pH = 6.0) was then added. Jun 7 = Day 192. 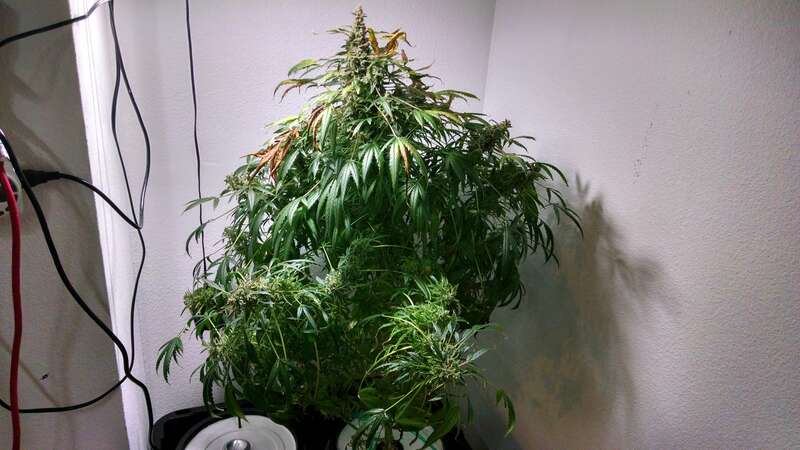 After 2 days of flushing, the plant was harvested. All fan leaves were removed. 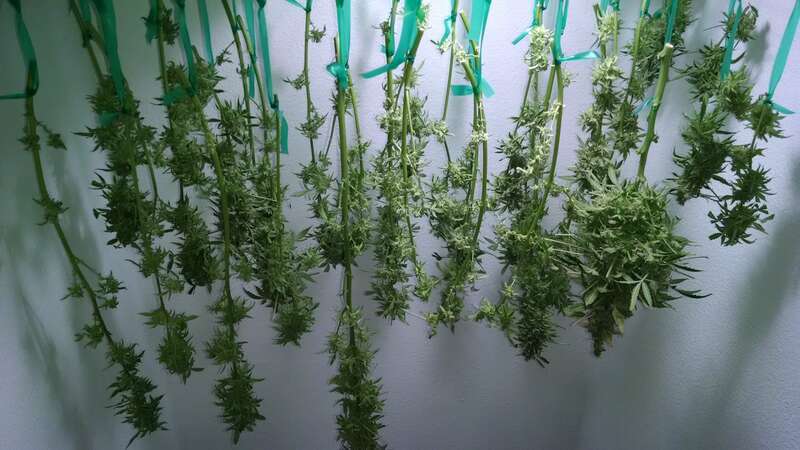 The remaining stems (covered with trichome-laden buds and sugar leaves) were hung upside to dry. A small fan was used to keep the air moving around the drying pieces, but was not pointed directly at them. After 5-6 days, the buds and leaves were mostly dry, so they were carefully trimmed off the stems and placed into a glass dish. The dried buds were allowed to sit in the open for another day, and were then transferred into glass quart jars. For a few weeks, the jars will be opened daily to allow air exchange. 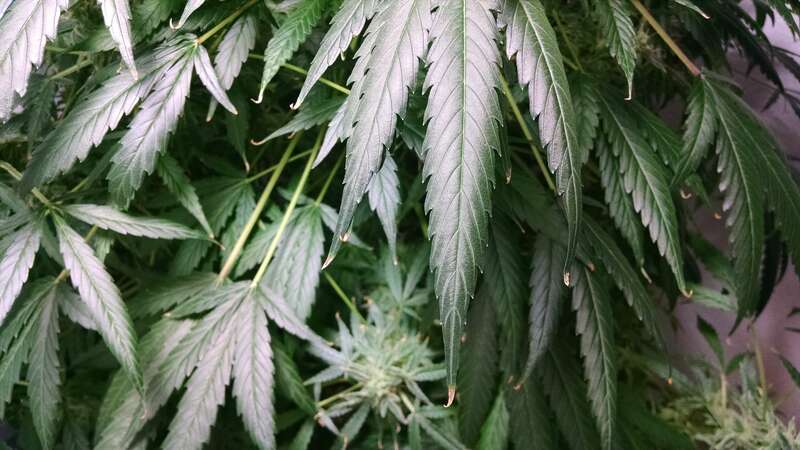 Overall, the marijuana plant consumed and transpired 26.5 gallons of nutrient fluid. 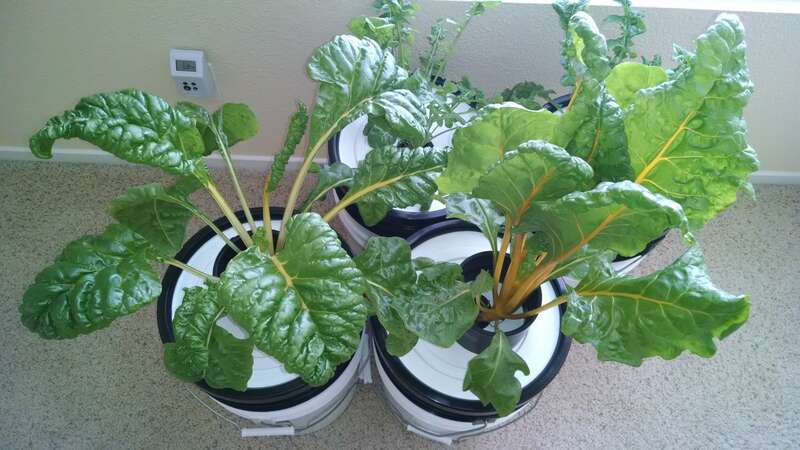 In the future, it might be more convenient to grow the plant in a much larger vessel (such as a 32-gallon trash container) rather than the smaller Two Bucket System that I used here. Arugula is a tasty green, but it can be a bit overpowering if used alone. I like to include about 50% arugula in my mixed green salads. Oct 9 = Day 0. Plants started from seed (Botanical Interests). 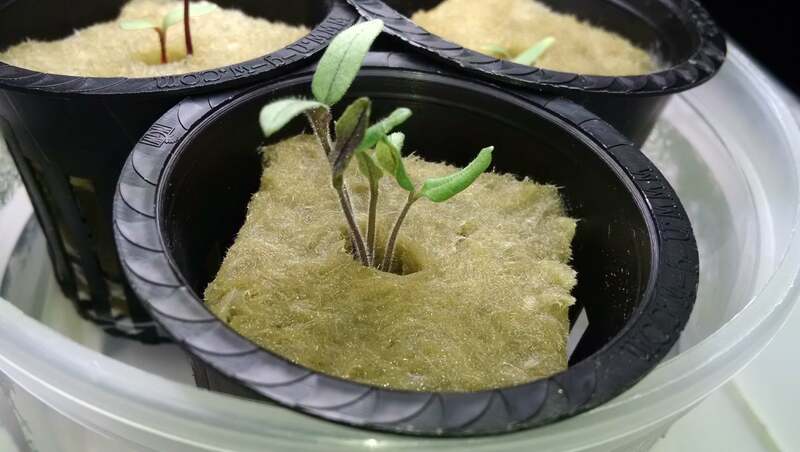 Seeds sowed in 1.5-inch rockwool cube in 2-inch net-pot. Moistened with Seedling Blend, a dilute blend of fertilizers. N-P-K (in ppm): 22-12-13. Oct 11 = Day 2. 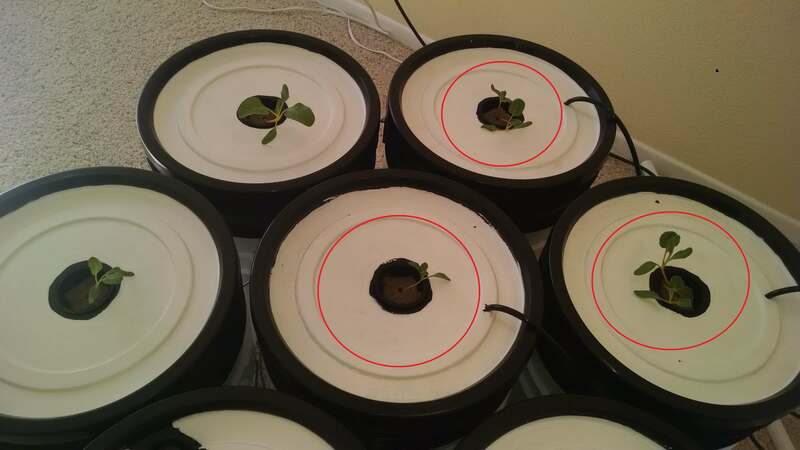 Plants germinated, placed directly under a fluorescent light (spiral bulb, 23W, 6500k) for 16 hours per day. Oct 18 = Day 9. 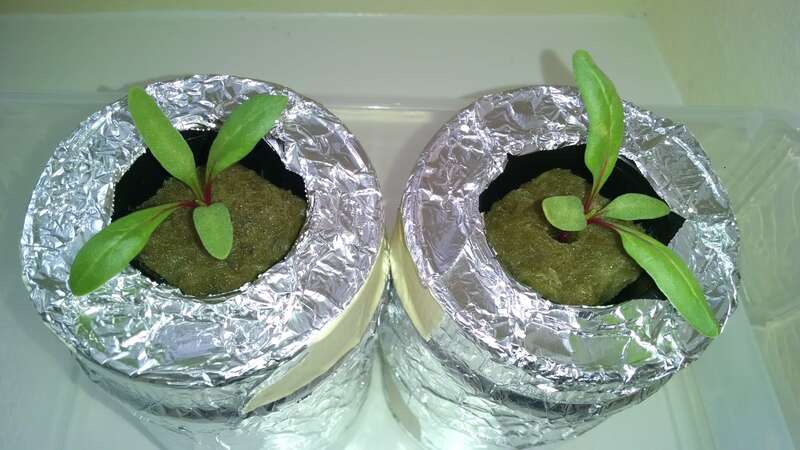 2 seedlings per rockwool cube. Oct 18 = Day 9. 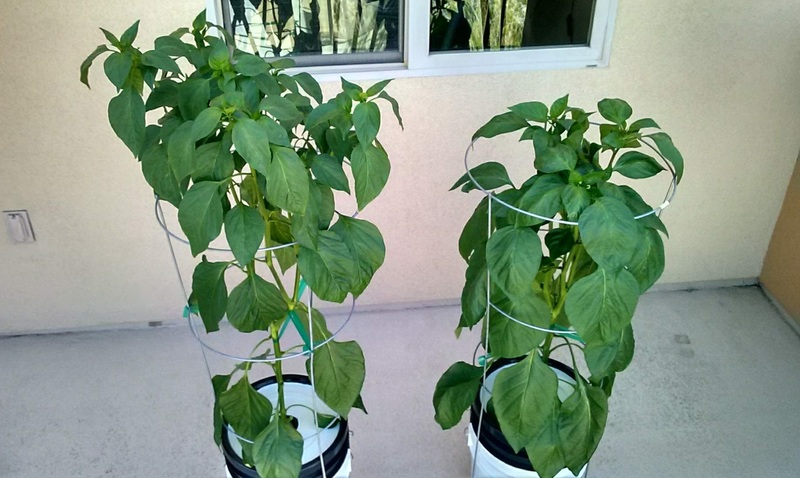 Installed the plants into two 5-gallon buckets using the MasterBlend-based Regular-Strength Blend. N-P-K (in ppm): 103-41-168. Plants now receive 10 hours of light per day from the LED grow light. Additionally, one of the buckets is getting aeration from a small air stone connected to the GH2716 air pump. The other bucket is non-aerated. Oct 29 = Day 20. Aerated bucket is on the right. Nov 13 = Day 35. Aerated bucket is on the right. Nov 18 = Day 40. Aerated bucket is on the right. Nov 18 = Day 40. 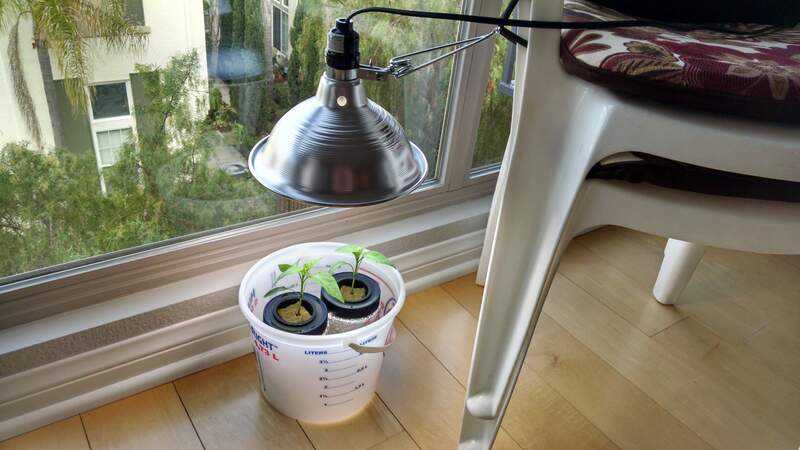 Plants were placed in front of a window receiving about 3 hours of sunlight per day. The use of the LED grow light was discontinued. The pH of the fluid in the buckets was measured: non-aerated = 4.5, aerated = 5.0. Since this is a bit on the low side for optimal plant growth, the pH was raised up to 6.0 by the addition of ‘pH Up’. The non-aerated bucket received 5 mL of pH Up diluted in 1 cup tap water. In the aerated bucket, the fluid level was slightly lower, so this bucket received 4 mL pH Up diluted in 5 cups tap water. Nov 27 = Day 49. Use of aeration was discontinued at this time. 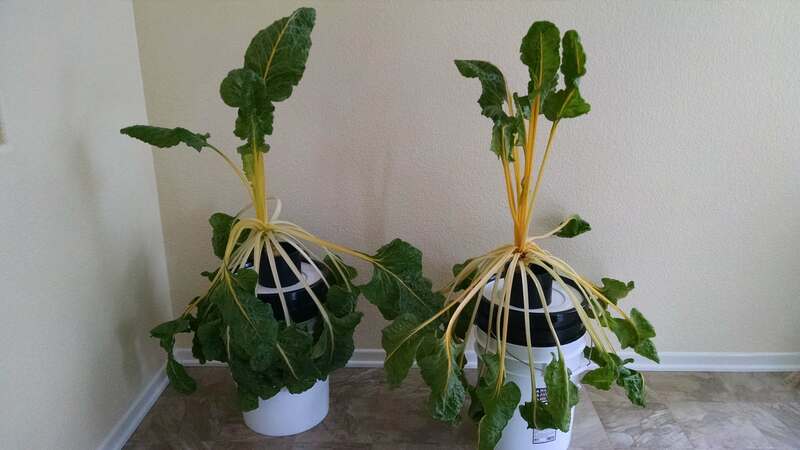 The plants appear to be the same size, so aeration does not offer any benefit to the growth rate of the plants. Dec 26 = Day 78. Began harvesting leaves for use in salads. Feb 3 = Day 117. Continuing to harvest leaves for salads every week. Checked the pH of the fluid in the two buckets: 6.5 and 7.0. Mar 13 = Day 155. One of the plants in the right bucket is bolting. The other plants are still growing well. The left bucket has plenty of fluid, but the right bucket is getting light, so I added 1 gallon of Regular-Strength Blend. Mar 31 = Day 173. Added 1 gallon of Regular-Strength Blend to each bucket. Apr 14 = Day 187. Added 1 gallon of Regular-Strength Blend to each bucket. Plants are bolting, so I trimmed off the flower stalks. Apr 19 = Day 192. Since the plants have bolted, the leaves have gotten quite bitter, and so the plants were discarded at this time. Total fluid used = 6-7 gallons per bucket. After a long and hot summer, my indoor grow room is just about empty, so I have lots of room to start up a large batch of new plants. 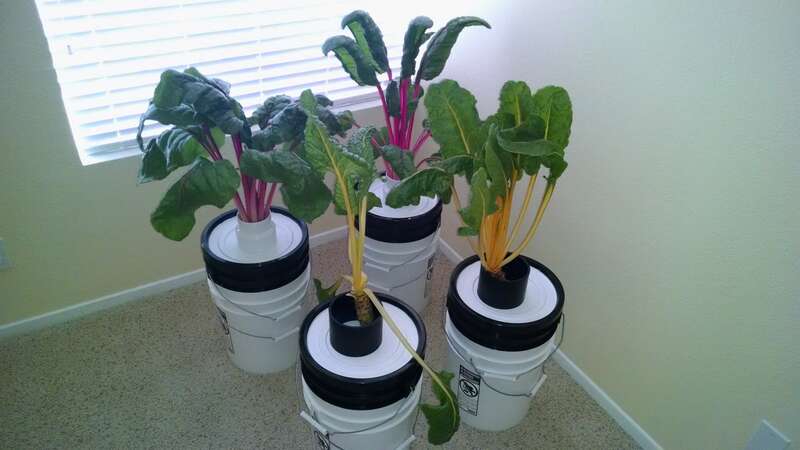 For a while, I have been wanting to do an experiment to determine whether aerating the fluid in the buckets would be beneficial for plant growth. 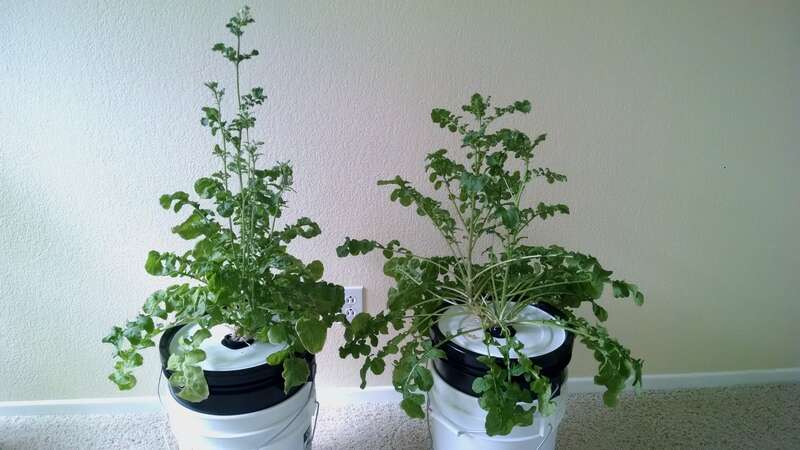 My general approach with Bucket Hydroponics has been to ‘Keep It Simple’, but I am curious about whether aeration would provide a significant benefit. 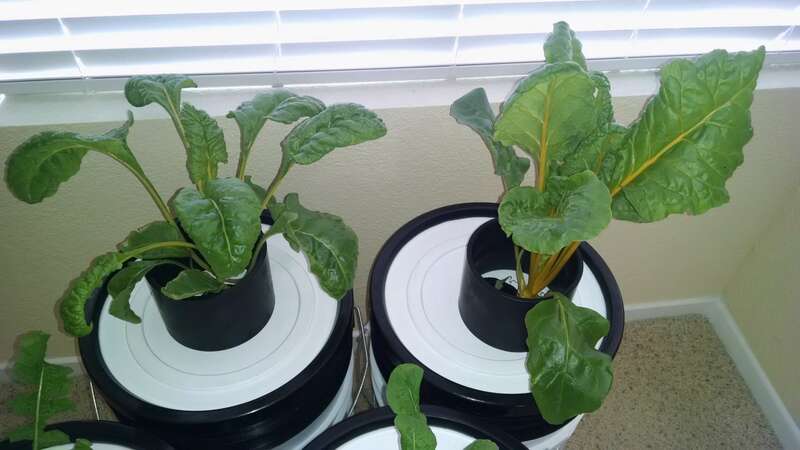 In this experiment, I will be growing El Dorado Swiss Chard. 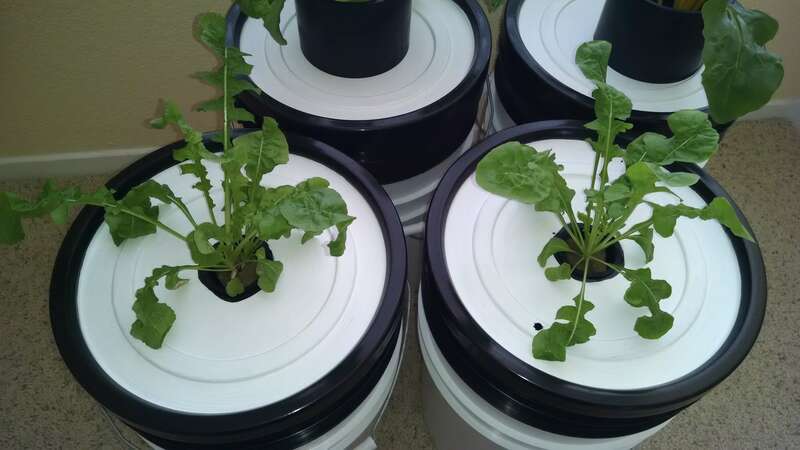 Half of the plants will receive aeration, and the plants will be grown in 5 gallon buckets. I will sow enough seeds for 15 plants, and I will pick out the best plants for the experiment. For aeration, I will be using the General Hydroponics Dual Diaphragm air pump, model GH2716. I bought this pump used from my local hydroponics store for $40, so my investment is not large. This pump is a bit noisy for using inside my house, so I will have to see some real benefits to justify its use. Sep 25 = Day 0. 15 plants started from seed (Park Seed). 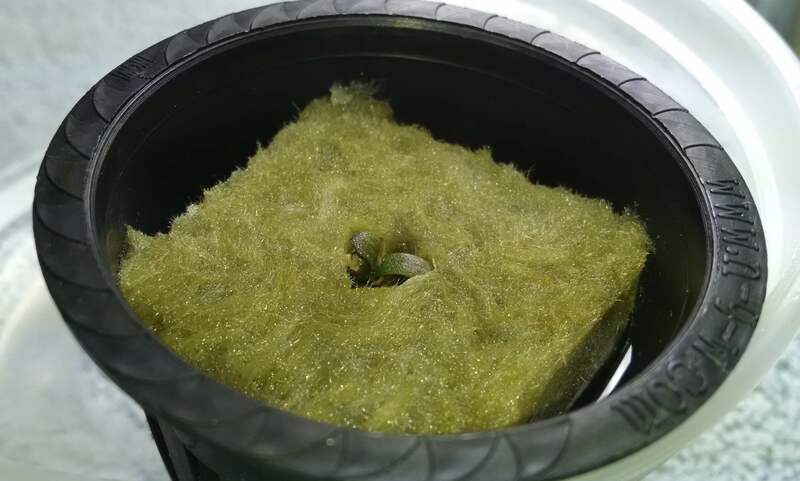 Seeds sowed in 1.5 inch rockwool cube in 2 inch net-pot. Moistened with Seedling Blend, a dilute blend of fertilizers. N-P-K (in ppm): 22-12-13. Sep 27 = Day 2. 4 of 15 plants have germinated. 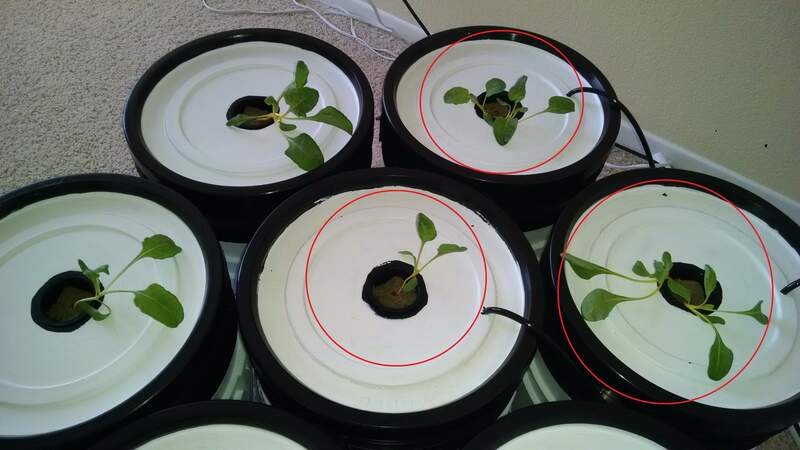 Placed seedlings directly under a fluorescent light (2 ft. T8 bulb, 17W, 6500k) for 16 hours per day. Sep 28 = Day 3. 8 of 15 plants have now germinated. Sep 30 = Day 5. 12 of 15 plants have now germinated, but 4 of the plants are growing too leggy and are falling over, or have a bit of mold on the stems. These 4 plants were discarded. 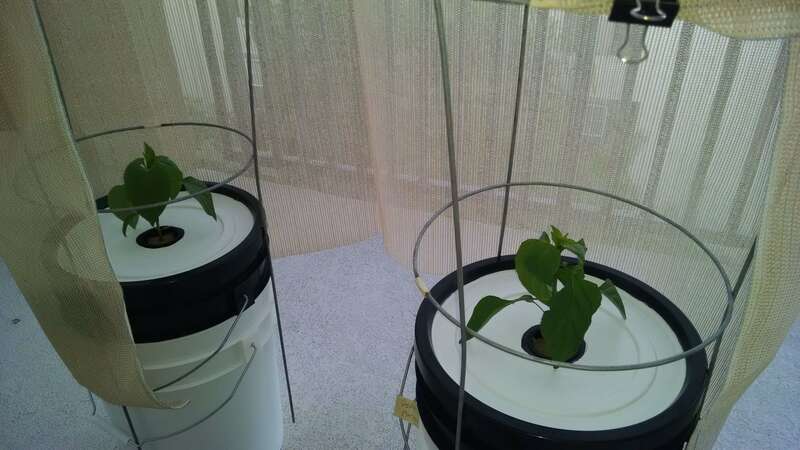 The remaining plants were put into a sunny window with a small fan blowing on them for 3 hours per day, in an attempt to toughen up these plants. The rest of the day, the plants are under the fluorescent lights. Oct 5 = Day 10. Plants are still getting too leggy, so they were moved directly under an LED grow light for 11 hours per day, with a fan blowing on them. Oct 8 = Day 13. 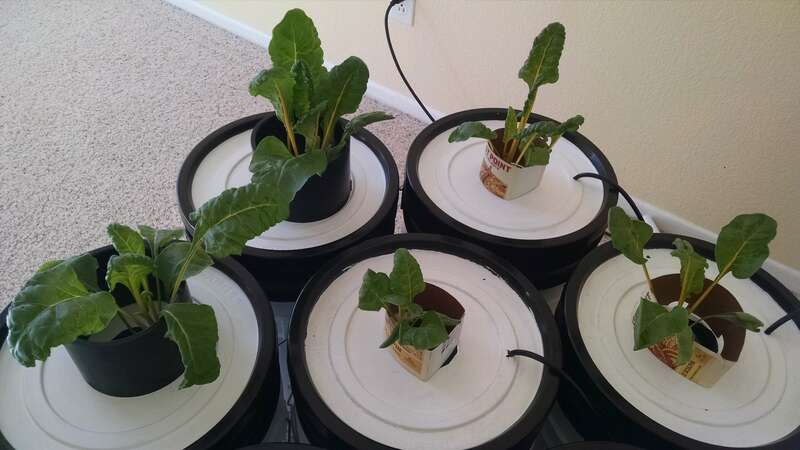 Installed the plants into 5 gallon buckets using the MasterBlend-based Regular-Strength Blend. N-P-K (in ppm): 103-41-168. 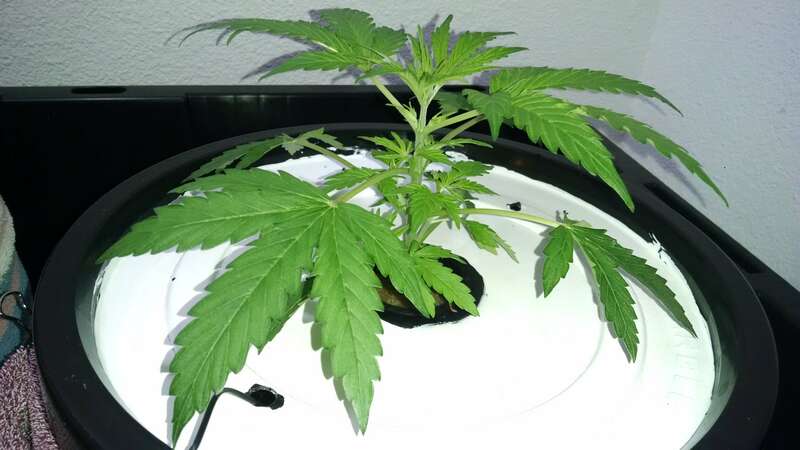 Plants continue to receive 11 hours of light per day from the LED grow light. 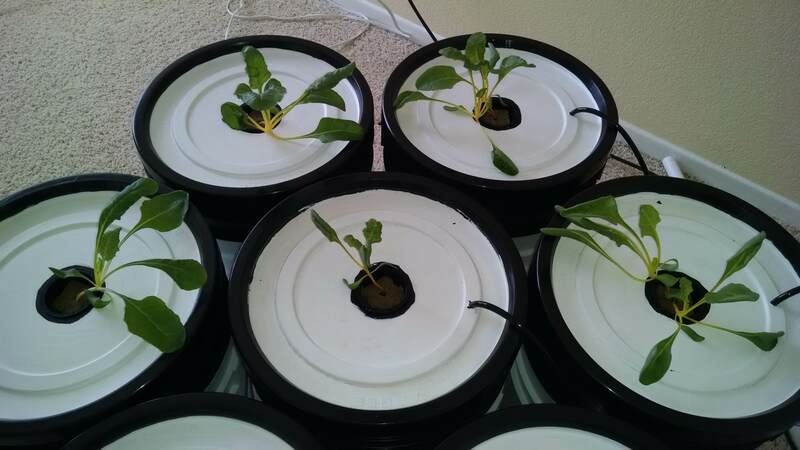 Additionally, 3 of the buckets are getting aeration from small air stones connected to the GH2716 air pump. The other 2 buckets are non-aerated. In some of the buckets, more than one plant is growing in the rockwool cube; I am planning to thin down to 1 plant per bucket eventually. Oct 10 = Day 15. The plants receiving aeration are circled red. Oct 19 = Day 24. The plants are growing, but they tend to flop over and have difficulty standing upright. 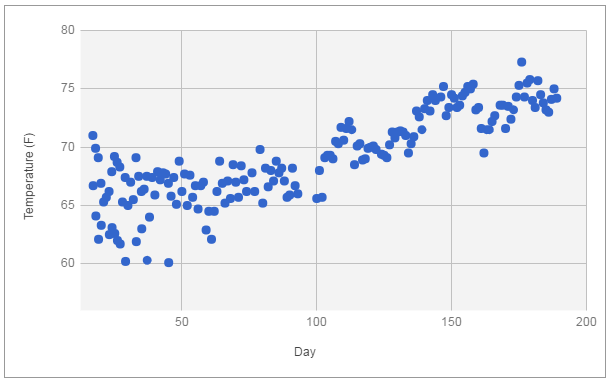 The grow room is still too hot at this time of the year, fluctuating daily between 75-80 °F. Checking the quality of the solutions, the aerated fluid is crystal clear, while the non-aerated fluid seems cloudy and turbid. Oct 19 = Day 24. Plants receiving aeration are circled red. Oct 29 = Day 35. The 3 aerated buckets are on the right. Nov 6 = Day 43. Thinned down to 1 plant per bucket. Nov 13 = Day 50. The 3 aerated buckets are on the right. Nov 13 = Day 50. 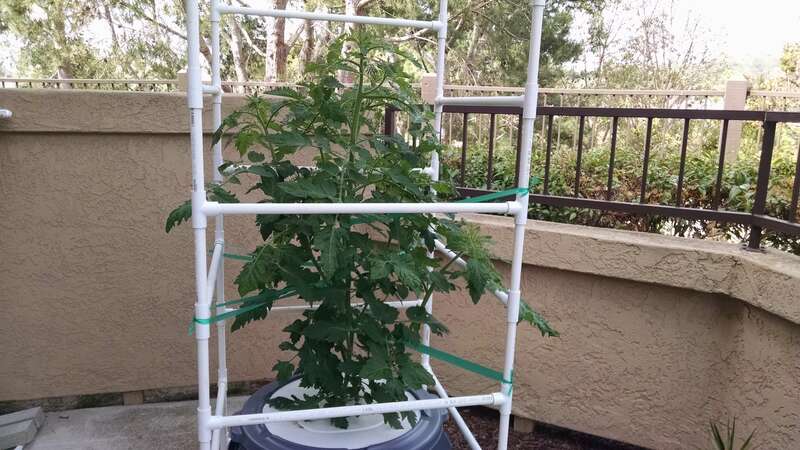 The plants are getting larger, and they were starting to flop over, so I installed rigid collars to keep the plants upright. The best collars are shown on the left, consisting of 4 inch ABS couplings. The ABS collars are heavy and stable. Other collars were made of cardboard, but these did not work quite as well as the ABS couplings. 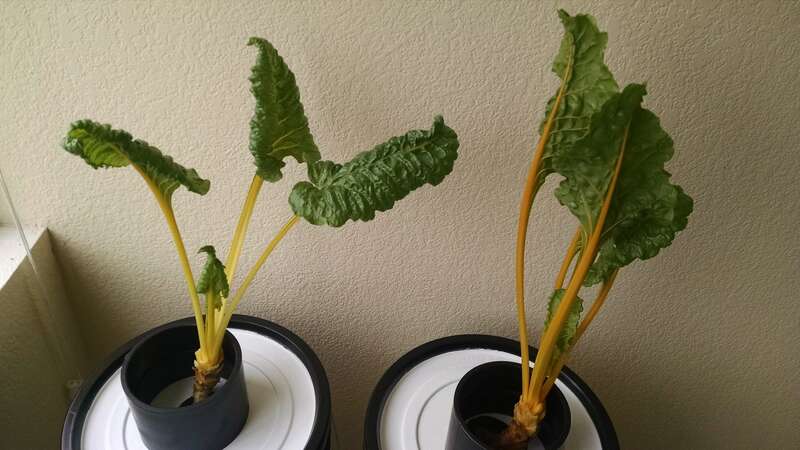 I placed the ABS collars on the 2 largest plants, the ones in the non-aerated buckets. Nov 18 = Day 55. Aerated plants are on the right. Nov 18 = Day 55. 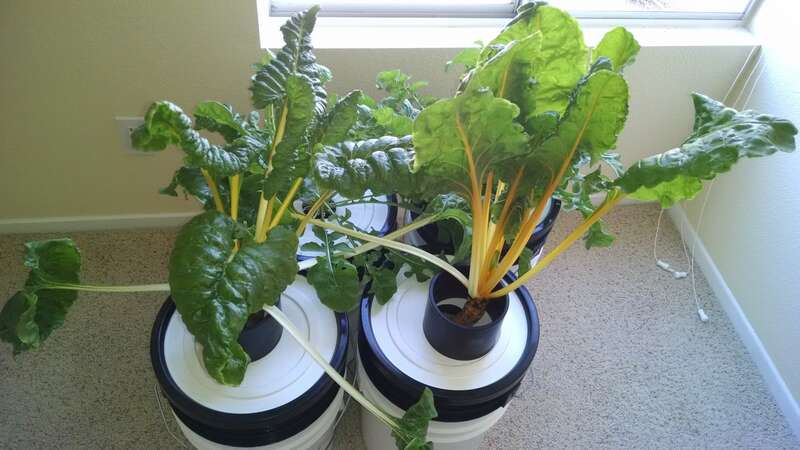 The plants without aeration are clearly bigger than the plants in the aerated buckets. The experiment was concluded at this time. 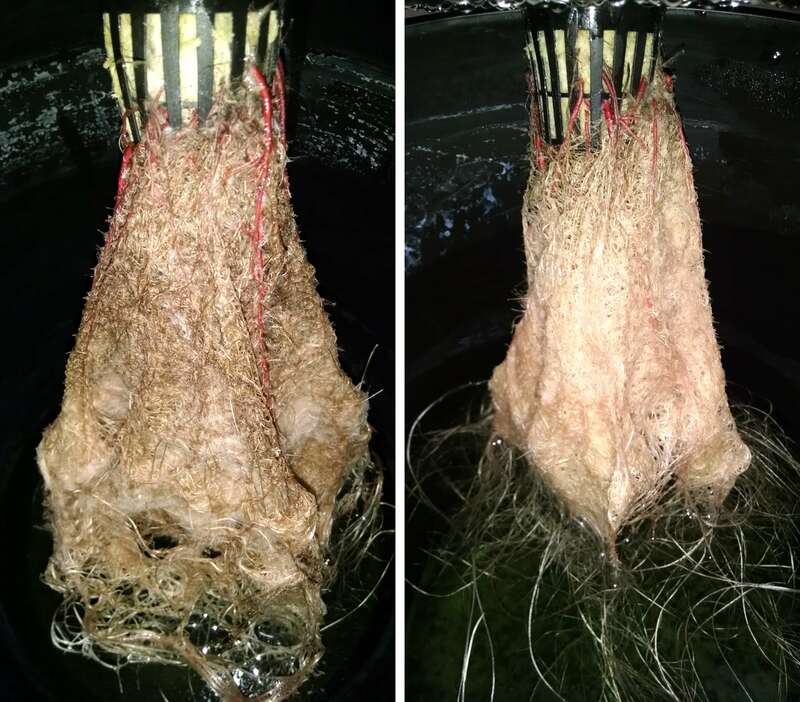 The result of this study is surprising, I had expected that aeration would provide some benefits to the plant growth, but it did not. 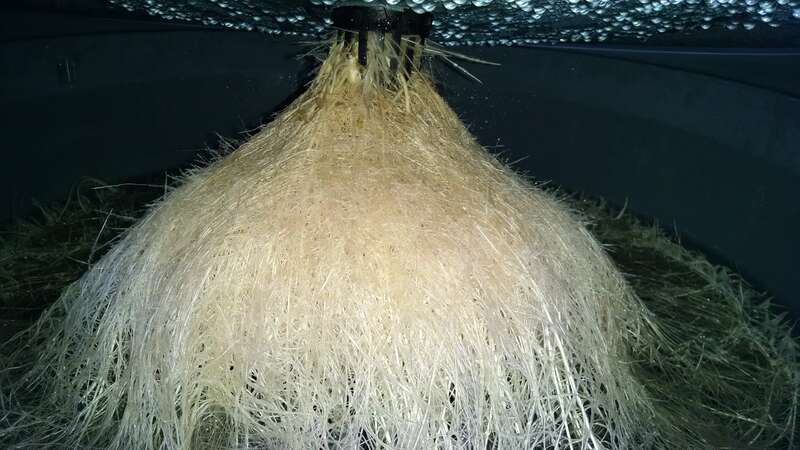 Perhaps the aeration resulted in turbulence to the roots in the bucket, which was inhibitory to growth. On a positive note, the fluid in the aerated buckets was very clear and clean. In contrast, the fluid in the non-aerated buckets is slightly cloudy, and the stagnant fluid has a ‘skin’ on the top with lots of precipitates at the bottom of the bucket. 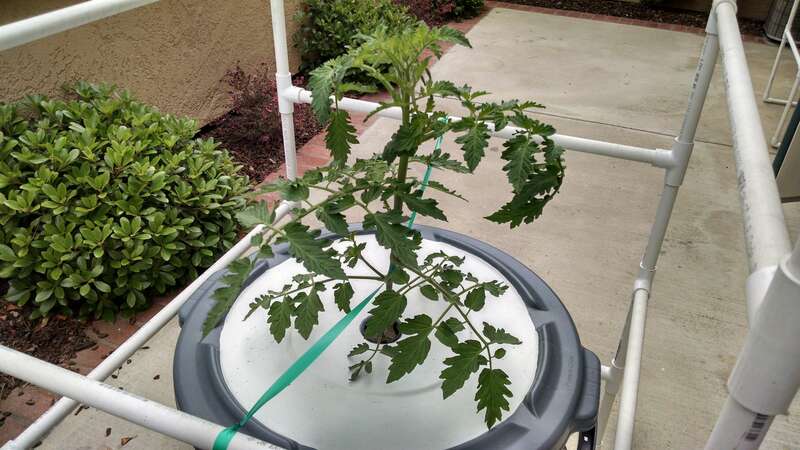 Movement of the fluid within the bucket is helpful for keeping the fluid fresh and clean, but is not necessary for healthy plants. The 3 plants in the aerated buckets were harvested. The pH of the fluid in the buckets was measured: 4.5, 5.0, 6.5. I’m not sure why these buckets had different pH values. 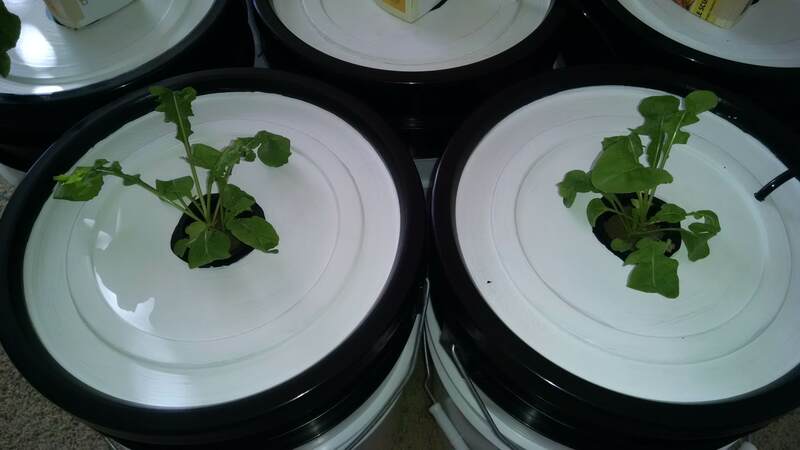 The 2 plants in the non-aerated buckets were allowed to continue growing. 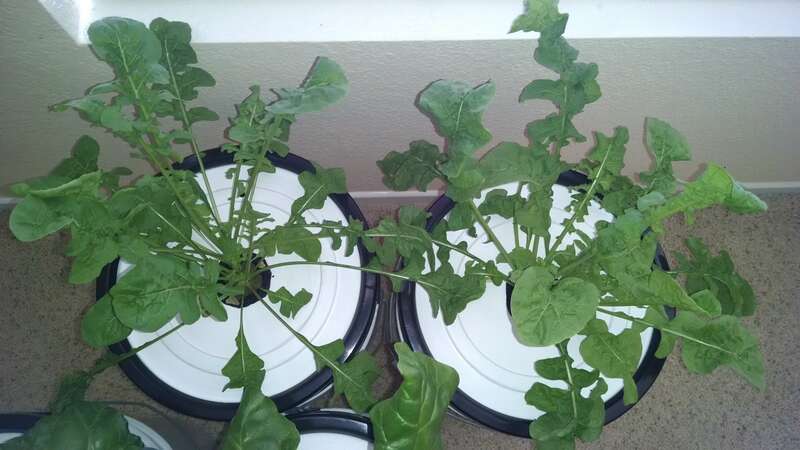 These plants were placed in front of a window receiving about 3 hours of sunlight per day. 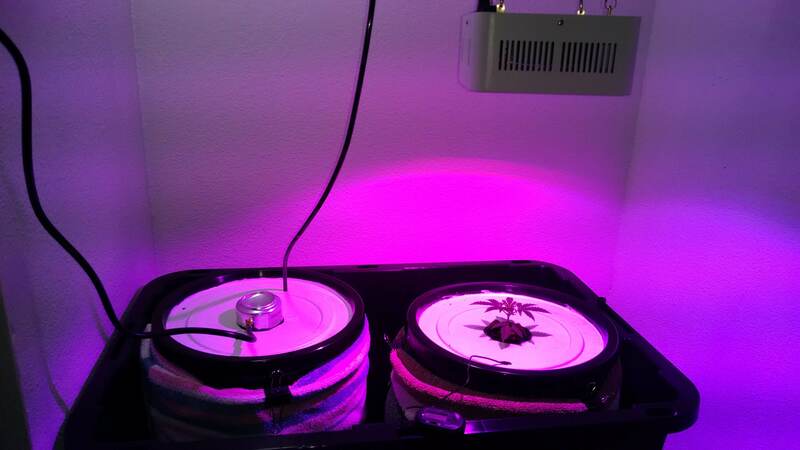 The use of the LED grow light was discontinued. The pH of the fluid in the buckets was measured: both buckets read 4.5. 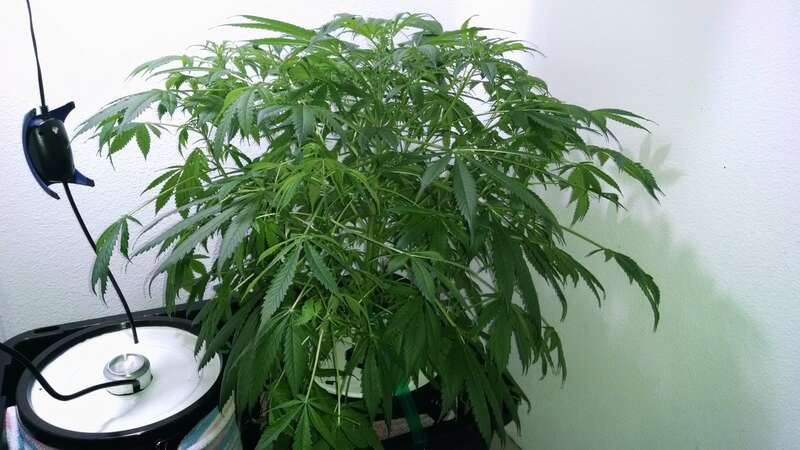 Since this is a bit on the low side for optimal plant growth, the pH was raised up to 6.0 by the addition of 5 mL of pH Up diluted in 1 cup of tap water. Dec 30 = Day 97. Started harvesting lower leaves. Feb 3 = Day 132. I have had 3-4 big harvests of leaves. The plants are still going strong. Checked the pH of the fluid in the two buckets. Both were 6.0. Mar 13 = Day 170. Both buckets were getting a bit light, so I added 1.25 gallons of Regular-Strength Blend to each bucket. Mar 31 = Day 188. Added 1 gallon of Regular-Strength Blend to the bucket on the left. Apr 14 = Day 202. Added 1 gallon of Regular-Strength Blend to the each bucket. May 5 = Day 223. Added 1 gallon of Regular-Strength Blend to the bucket on the left, 0.5 gallons to the bucket on the right. May 25 = Day 243. Added 1 gallon of Regular-Strength Blend to the each bucket. May 25 = Day 243. El Dorado is in the front, Flamingo Pink is in the back. Jun 19 = Day 268. Added 1.5 gallons of Regular-Strength Blend to the bucket on the left, 0.75 gallons to the bucket on the right. Jul 6 = Day 285. Added 1 gallon of Regular-Strength Blend to the each bucket. Jul 17 = Day 296. Added 1.5 gallons of Regular-Strength Blend to the each bucket. Aug 3 = Day 313. Added 0.75 gallons of Regular-Strength Blend to the bucket on the left, 0.25 gallons to the bucket on the right. Aug 15 = Day 325. Added 1.5 gallons of Regular-Strength Blend to the bucket on the left, 1 gallon to the bucket on the right. Aug 22 = Day 332. Added 1 gallon of Regular-Strength Blend to the each bucket. Sep 4 = Day 345. After almost a year of growing, I am finally going to harvest the remaining leaves. I find that the stalks are a bit fibrous and inedible, but the leaves are still OK for steaming. Each bucket has about 0.5 gallon of fluid remaining. Total fluid consumed: 17 gallons (left plant), 13.75 gallons (right plant). Rosita is an heirloom variety of eggplant, originally developed in 1940s by the Puerto Rico Agriculture Experiment Station in Rio Piedras. The plant yields lavender-pink fruits that are about 8 inches long and 4 inches wide, with a mild, white inner flesh. Jun 18 = Day 0. Plant started from seed (Baker Creek). 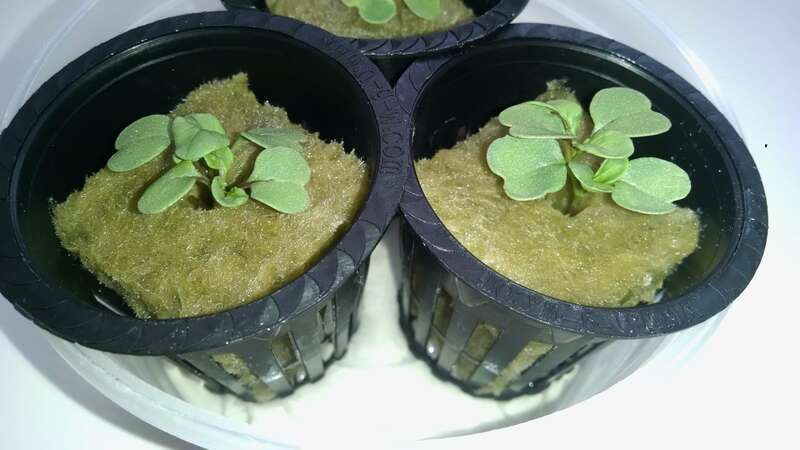 Seeds sowed in 1.5-inch rockwool cube in 2-inch net-pot. Moistened with Seedling Blend, a dilute blend of fertilizers. N-P-K (in ppm): 22-12-13. Jun 22 = Day 4. 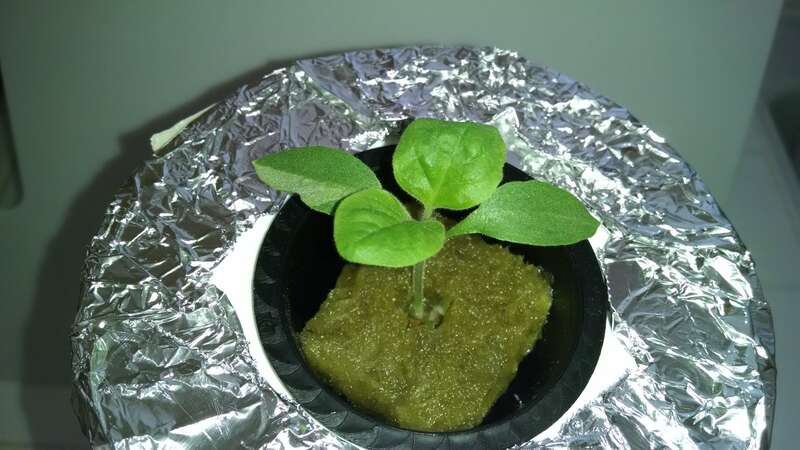 Plant germinated, placed directly under a fluorescent light (2 ft. T8 bulb, 17W, 6500k) for 16 hours per day. Jul 1 = Day 13. 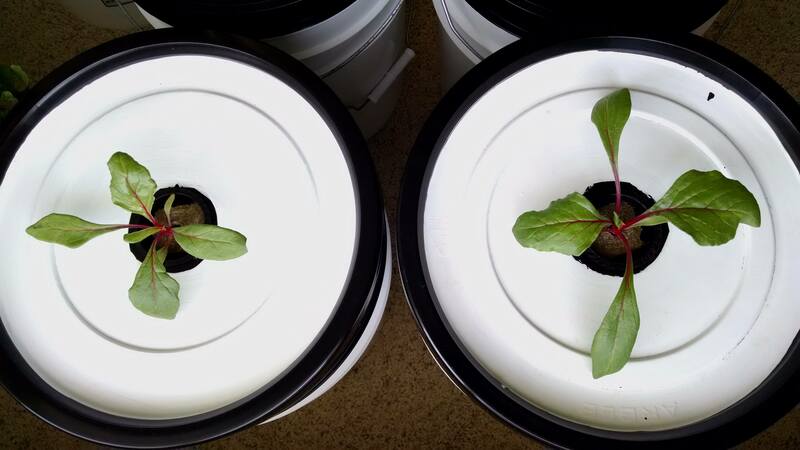 Installed plant into 11 cup plastic container using the MasterBlend-based Regular-Strength Blend. N-P-K (in ppm): 103-41-168. Jul 2 = Day 14. Starting to let this plant have a few hours of outdoor exposure, to toughen up the plant. Jul 8 = Day 20. Plant is now outside all of the time, receiving 4-5 hours sunlight per day. Jul 17 = Day 29. 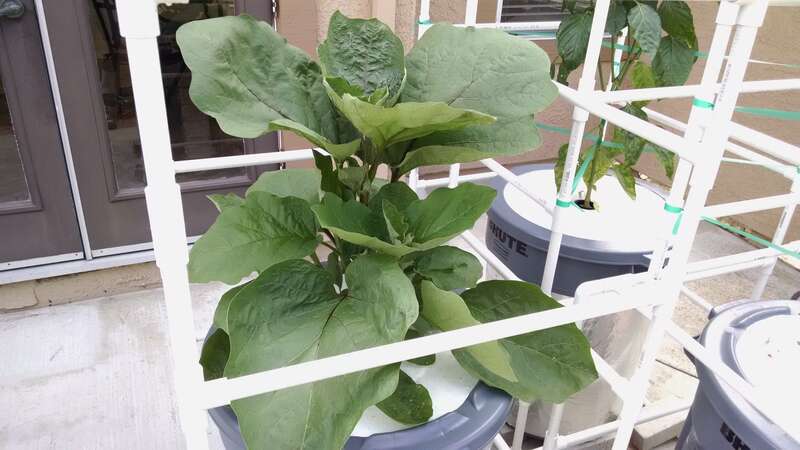 Installed plant into 32 gallon plastic container using the Masterblend-based Regular-Strength Blend. N-P-K (in ppm): 103-41-168. Aug 11 = Day 54. Mites have been found on several areas of the plant, near the newly growing shoots. Forcefully blasted the mites off by spraying with diluted horticultural oil (diluted 1 tbsp into 1 quart of water in a spray bottle). Aug 13 = Day 56. Inchworms (loopers) were found on several of the leaves, creating small holes. 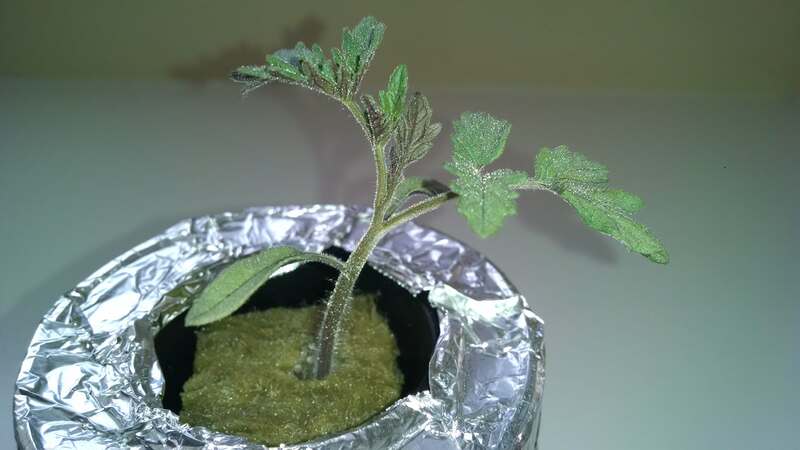 Entire plant was sprayed with a solution of BT, diluted in water (5 mL BT per liter). Sep 12 = Day 86. 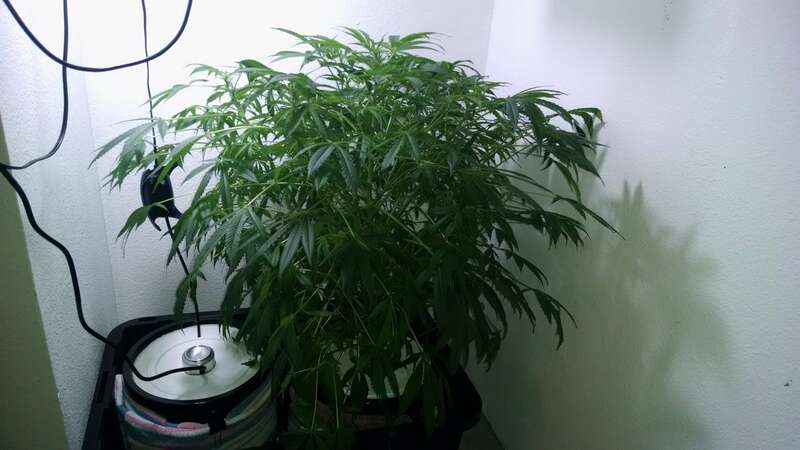 Plant has grown quite large, but still has no pollinated fruits. Several flowers are present, and I have been hand pollinating, but still no success. Also, most of the plant’s leaves are infested with mites. There does still seem to be plenty of fluid left in the reservoir though, so I guess I’ll keep it around for a bit longer. Sep 12 = Day 86. This plant has beautiful flowers, but no fruits. Sep 22 = Day 96. Plant leaves look bad, with lots of mites and inchworms, plus some damage from powdery mildew. Plant is still not producing any fruits, so the plant was discarded at this time. Total fluid used = 24 gallons. Final pH of fluid = 6.5.